I had never heard of this. Yes, I was as shocked as you are now! Shockingly, I was not aware of this paradise. It was and continues to be the Mecca for motorbike riders. It was in 2011 sitting in my college library and browsing, not technical though Facebook it was and then saw these amazing pictures uploaded by my friend who is an avid biker. The pictures got my eye balls popping; I could not believe I was seeing something so beautiful and yet adventurous – surely it had to be somewhere abroad in an exotic country. So I googled about it to make sure it was India. There were umpteen blogs, pictures and videos describing it as Must Do, Once in a Life Time Experience and etc. 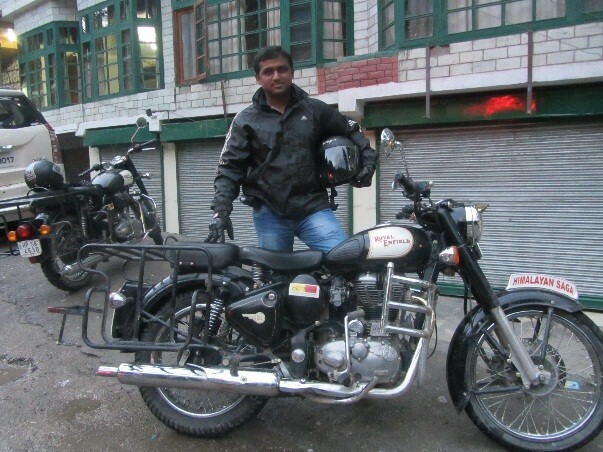 It was then that I realized how cut off I was from the North India and the joys of real biking. (Courtesy: Rajesh R) Since then, every year, every vacation I used to pester my friend Rajesh about the ride and how I could join one of the groups. I even pestered my close buddies for this ride and had chalked out plans for the entire journey. All they had to do was just say ‘yes’. But that did not happen and I got busy with college, placements and work. It is 2014 and things in my life started to change rather quickly, I was on the verge of getting married and it hit me that it is now or never! Soon I decided it has to be this year and few friends also agreed to come. Initially it was a 27 day plan starting from Bangalore. The plan was scary – yes my friends are weenies – and many of my other friends thought we had lost our minds. Nonetheless, it was not something new and many had done it before. My big hearted friend, Parthasarthy agreed to lend me his Bullet for the ride. Finally, I was all set and excited. Yay! But things turned upside down. All of my friends dropped out saying, ‘leaves not sanctioned’, ‘parents are not allowing’, ‘no money’, etc. I was literally gutted and thought I would never get to live my dream. Shattered and angry at my friends though something kept nagging me, a tiny voice in my head kept on going – last chance and probably last year – and decided to do this even if it meant that I had to do it alone. Then I Googled some more for a good package tours and finally found one of the travel agency which was the best one of the lot. The website looked promising. Luckily one of my friend, Sandeep had used their services in the previous batch and this was the last batch before the season closed. Though the price for package was steep I could not afford to lose this opportunity and straight away transferred the amount and booked my train tickets even before getting the leaves sanctioned – knew I could convince my boss! I told him I was getting engaged.….. Yes it turned out to be one great engagement which I shall not forget for the rest of my life. So here we go..! 28th & 29th August: Bangalore to Delhi My journey started on 28th August from Yeshwantpur to New Delhi Sampark Kranthi express at 1400 Hrs. The plan was to arrive in Delhi and then take a bus to Manali as that was where the ride started. Throughout the journey one thought that kept hitting me profoundly was that this was a once in a life time opportunity and none of my friends were lucky enough to accompany me, but sometimes you got to do things on your own no matter what. With little inputs from Sandeep I packed my bag. One word of caution here, we are usually suggested to carry light when traveling. And even I go by that and pack my bag light for most of the trips. But this one I just regretted, like hell. The saying, The More the Merrier is so true for this ride. I probably looked like a soldier who was headed for the war with the backpack even with my minimum stuff. The best thing when traveling long distances in train is to carry a good book or if you are into blogging, it is the best time to finish those pending blogs. I had ‘Dongri to Dubai’ by S Hussain Zaidi a book on Dawood Ibrahim and his heroics, his rise from a slum in Bombay. I had challenged my friend, Mihir that I will finish reading this book before I reach Delhi. And I did finish flipping through each page without even bothering to see my luggage in train. This book is nicely written by Hussain (not ME) where he takes you through the mafia which existed in Bombay. Some of the incidents in the book send shivers down your spine. My co-passengers were very interesting (no girls). It was interesting to see how people have travel kheeda (worms) no matter from which walk of the life they are from. Here I had 3 fellows who were uneducated (no offence) and hardly could manage to live on their salary. Still they managed to see the places down south namely, Rameshwaram and Tirupathi. They shared few funny incidents, which is worth mentioning here. A tea which costs Rs.5 was charged Rs.15 as they did not understand the local language. These folks, took their wet underwear and put on the railing of the window. And it dried in no time. What do we call this? Jugaad or Gawaar? Apart from this I also had one guy who was headed to Delhi for his marriage. He had a typical way of getting sleep in night. He carried ‘those magazines’ with him and would read them to fall asleep! Also there was a wannabe pilot and officer. Later got to know that the officer-to-be was recommended for the Coast Guards and was on his way to the medicals. Hope he gets his uniform. I guess traveling in train is the best option if one has to see the diversity of India. Not just with people but with the landscape also, moving from one state to other. And also if you are low on budget…. 30th August: Delhi I reached Delhi around 14:00 Hrs. 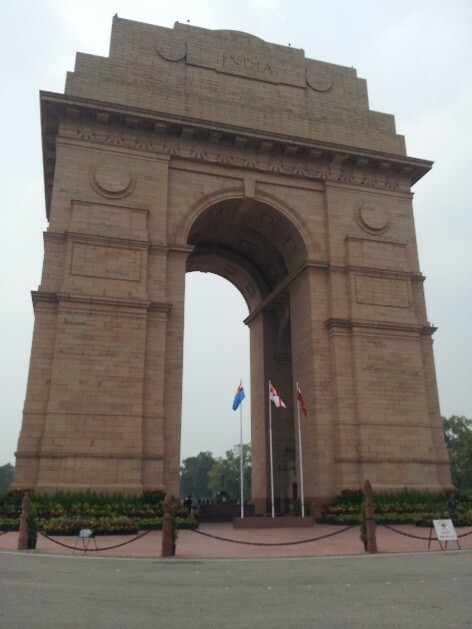 I and the officer-to-be decided to see India Gate before heading to respective destinations that evening. I was sweating profusely due to the high temperatures in Delhi. It is so sultry at times and walking becomes a pain. 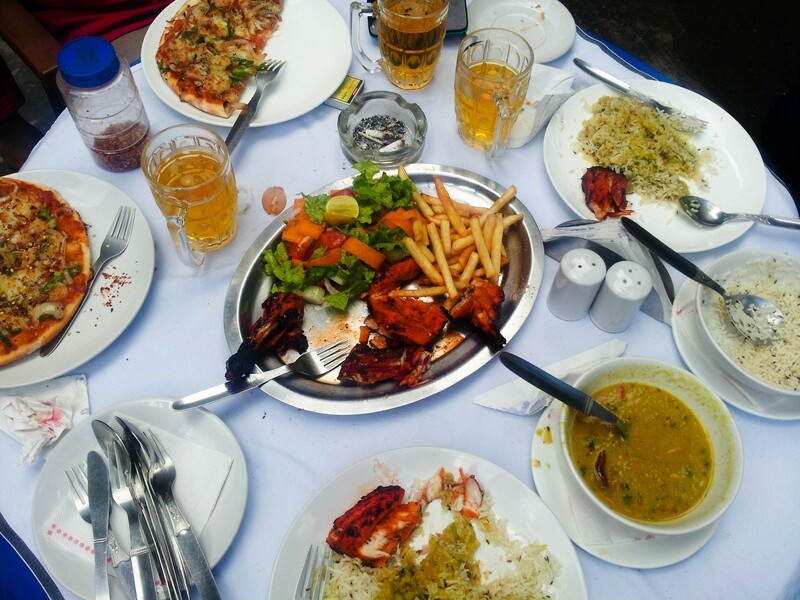 After visiting India Gate we took an auto rickshaw for Connaught Place for lunch. But we could not find anything good and decided to take metro for our respective locations. I had to get down at RK Ashram. By 16:00 Hrs reached the travel agent office and waited for the Volvo bus to arrive. Around 17:30 Hrs the bus finally arrived and left for Manali with 8 other riders whom I did not know till next day. The bus was really superb with all the comfort and freebies offered on board. Seated next to me was Mr. Sameer, a businessman, an avid reader, traveler and philosopher. Rear to find such a person. Thanks to him I have my next ride planned out and also ended up developing a liking for the history. History at times is really important and comes in handy when you visit places. Now I have started the habit of reading about the places before I visit. 31st August: Manali I had a good sleep and woke up early morning thanks to the ghat section and the Volvo veering, as if it was playing the famous snake game. Most of us are prone to throw up on ghat sections. And it was time for some fellow passengers to throw up, all thanks to the travel sickness!!! Even I was on the verge of it but somehow managed to escape. The simple rules to avoid puking in ghat section is: eat light, do not look into the valley, close your eyes and listen to some music. 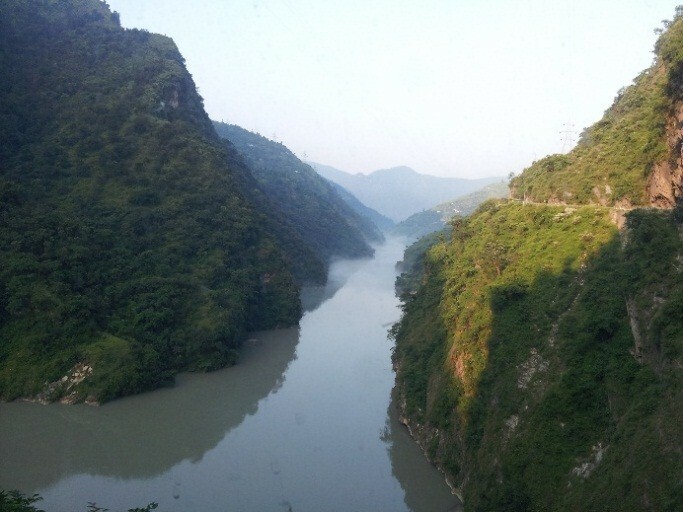 I managed to see few wonderful scenes of the river Beas. The scenes literally made me forget what has happening around me and I badly wanted to take a selfie. And I was wondering if I could be greeted every morning by these scenes back home. 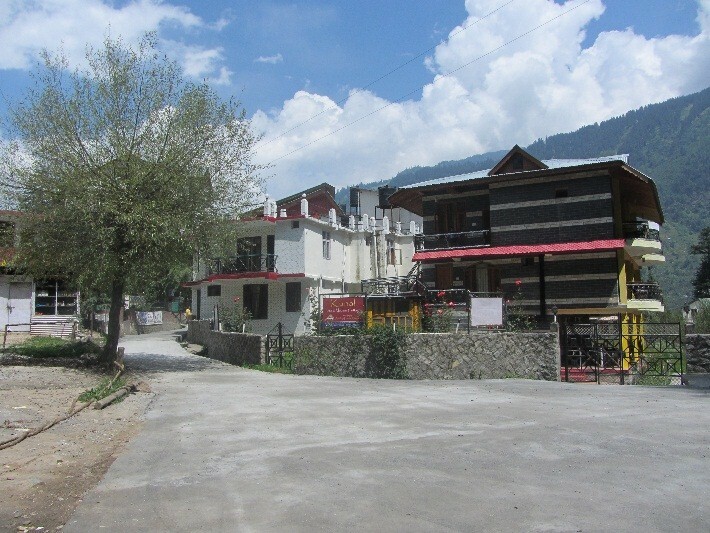 Finally I reached Manali by 11:00 in the morning. The vehicles arranged by our travel agency were waiting for us. It took almost an hour for us to reach the hotel and around 12:00 checked into the hotel. The hotel was good if not super luxurious considering the amount we had paid. We had plenty of time and the ride was to start following day. 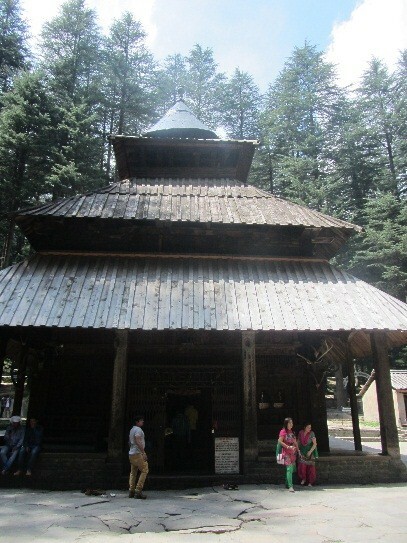 So we decided to explore the places in and around Old Manali. We visited Hidimba and Ghatotkacha temples which was very close to our hotel. Ghatotkacha, son of Bheem is a famous character in Mahabharath where he has a pivotal role to play in the battle which was fought between Kauravas and Pandavas. I had seen that role he played on television and could easily tell to my friends. I was very happy that I knew something! By evening we got our bikes and we asked to take it out for a local ride so that we could tell them if any problems were there with the bike. I just could not wait to sit on the bike and the moment the key was handed, I was off with that typical thumping sound of bullet. It was good for few hours but on our way back the bike refused to start. I guessed the spark plug would have gone kaput and parked it near hotel as instructed by our guide. I had to leave my bike there till the mechanic fixed it and that was to happen the next day. Justin offered me to drop till hotel. Now something about Justin Donais, he is a freelance cinematographer and a motorbike know-it-all guy. He has three bikes in his garage back in the States and he is very much fond of Indian cuisine, especially the spicy food. That was the common thing between me and him. So there we are, foodie and rider! A perfect combo. More about him as we go forward. I was really excited and the day had come for which I had been waiting for 3 years. It is so hard to sleep when you are so excited but I finally managed to force myself to sleep at 0200 hours. 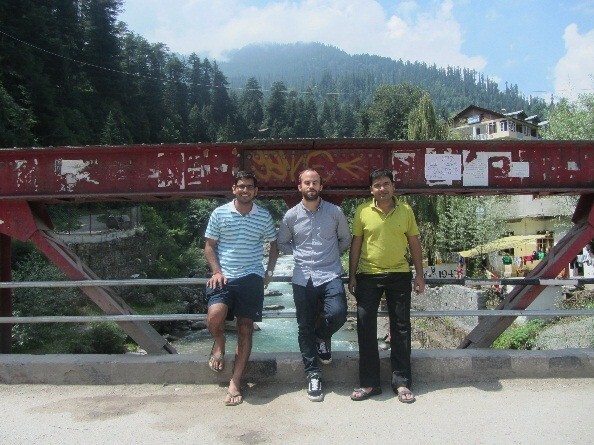 1st September: Manali-Rohtang-Keylong I woke up with a headache – thanks to sleep deprivation. Somehow it just wasn’t bothering me too much and the first thing I did was to fix the spark plug. My mechanic who is a ‘excellent’ guy when it comes to bullet replaced the spark plug and that trademark thumping sound of bullet was back. I was all geared up for the ride with the knee guard, elbow guard, helmet, balaclava and gloves. We straight away headed to fuel station to fill up our tanks for a long ride. The fuel charges were on us and it made sense at least to me because mileage again depends on the rider and his style of riding. We filled up the tank and also two spare cans of 5 liters each. 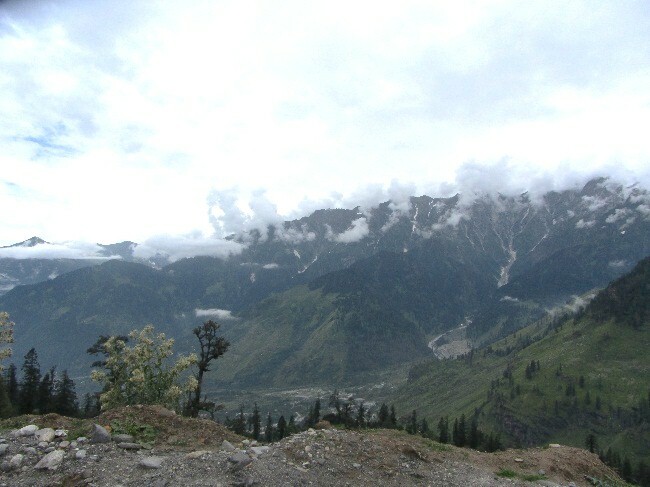 The route we were doing was Manali – Rohtang – Keylong. Once the guide, Mr. Sanjay gave us instructions and briefed us about our next stop we were off for the ride of our life. It was mad rush especially for me after waiting for days. 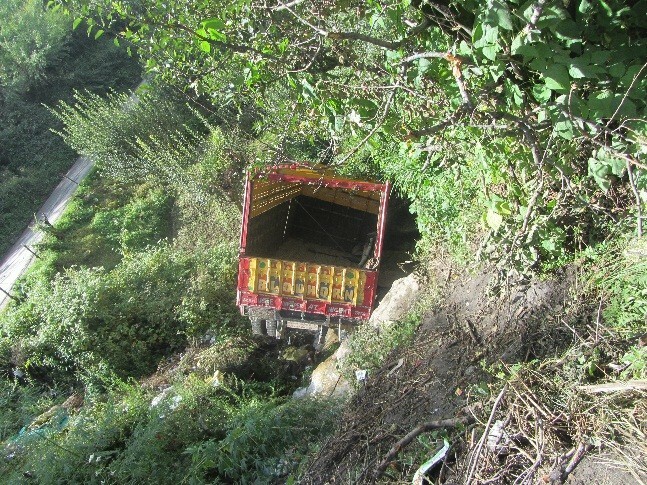 Then after few kilometers I see a lorry in the valleys!!! And that reminded us and cautioned where we were riding. As it is common with most of the trips, the first few hours most people spend time in taking pictures and we were no different. Even the sun was on our side. Just before we could climb the Pass of Deaths, Rohtang my bike started to leak fuel. The carburetor was leaking and I lost close to a liter of fuel. Luckily my mechanic, probably the best one out there who knew in and out of bullet replaced the carburetor in 5 minutes. I was happy to kick start the bike again and catch up with other riders. 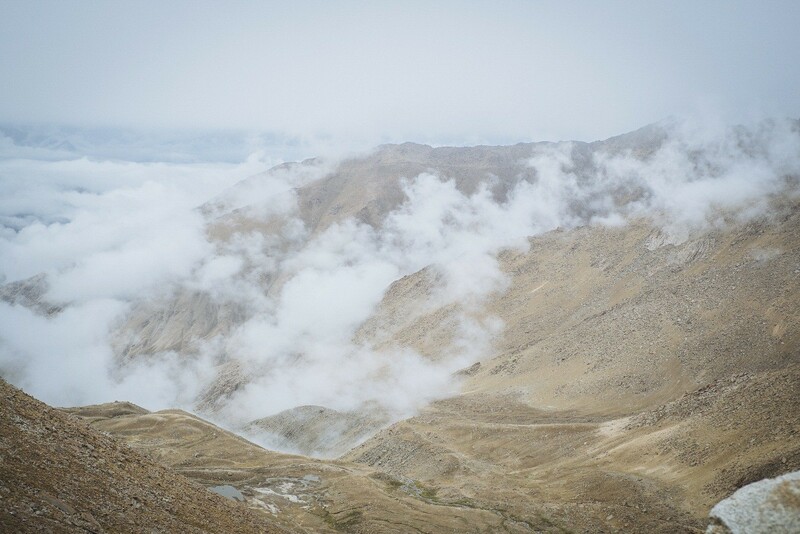 We were literally flying in the clouds if I could say, the whole ride after climbing the Rohtang pass was not short of a dream. 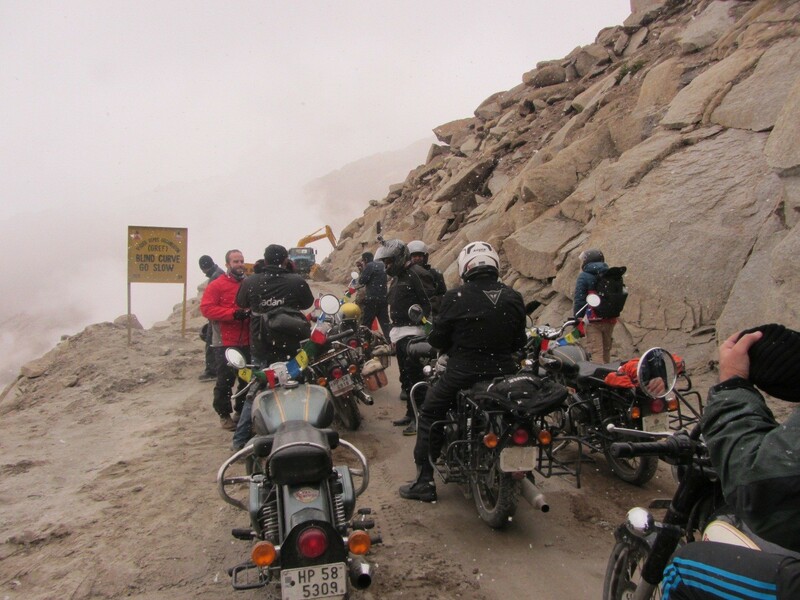 All the riders were enjoying every bit of it passing through the clouds. Then came the falls, not the waterfall. Three riders fell one after the other, something like the Domino Effect. Mr. Sameer’s bag had come off the saddle and he did not notice that. Mr. Aussie and his friends who were behind him tried to come aside but could not and lost their control. Luckily nobody was hurt. After few minutes we continued our ride down to Khoksar. Till we reached Khoksar, our backs were crying and I mean it. The cries were echoing in the mountains probably and we refused to listen. Finally reached Khoksar for lunch and before we could continue our ride, the metal bridge had a problem. The sheet metal put over the bridge had given off and the army guys were busy fixing it. Lost almost an hour of time. From there till Tandi the roads were excellent. Some amazing scenes and road runs parallel to river stream. With few wonderful curves it was a beautiful ride and my speedo read 100+ for the first time. We reached Tandi to fill up our tanks. Tandi is the only petrol station before you reach Karu and hence it is advisable to tank up as much as you can. The next few kilometers of road are the worst. We finally reached Keylong around 17:00 in the evening and had to wait for the vehicle to get our luggage and luckily this hotel had Wi-Fi. The obvious thing to do was upload few pics of the ride. Finally the vehicle arrived and I checked in to my room. Took a hot water bath and believe me it was the best thing that could have happened to end our first day. Around 20:00 went out for shopping and also to withdraw some money. SBI really has made its presence felt across the country. I came back for dinner around 21:00 and the dinner served was really bad and to add to our miseries even the service was painful. A special mention about our Indian waiters who work for these hotels and their behavior towards Indians. There was this waiter who refused to look at us and even ask for dinner. He was busy with the foreigners and literally was kissing their face (I cannot use few words). For the first time in my life I could feel what Dr. Ambedkar would have gone through those days! I guess the Dollar is to be blamed, not him……. 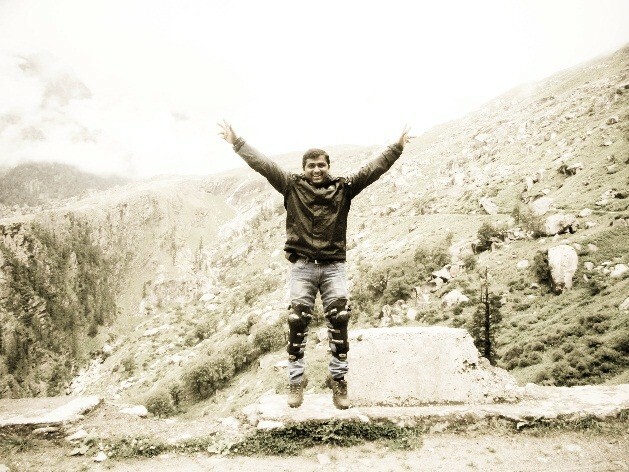 My head was aching and would have burst into pieces, not because of our Indian waiter but the lack of sleep and the Rohtang pass which had taken a toll on me. I had to take Aimol pill to overcome the severe body pain and it did help me to sleep. Next morning I woke up a lot better and went straight to check out my bike. Had to wake him up and made sure he was OK after passing through the Rohtang pass. On the other hand, Justin’s bike had few issues, thanks to his dirt biking skills!! His bike-saddle weld had given up and there was nothing we could do till Leh. 2nd September: Keylong-Baralacha-Sarchu I had read people saying on internet and in fact one of colleague saying that, the Leh ride is a life time journey and it tends to change people. It will make people look at life differently and the person will definitely go through an emotional and philosophical journey. Doesn’t it sound too philo? And one might probably laugh at it! But little did I know today’s ride would make it true. 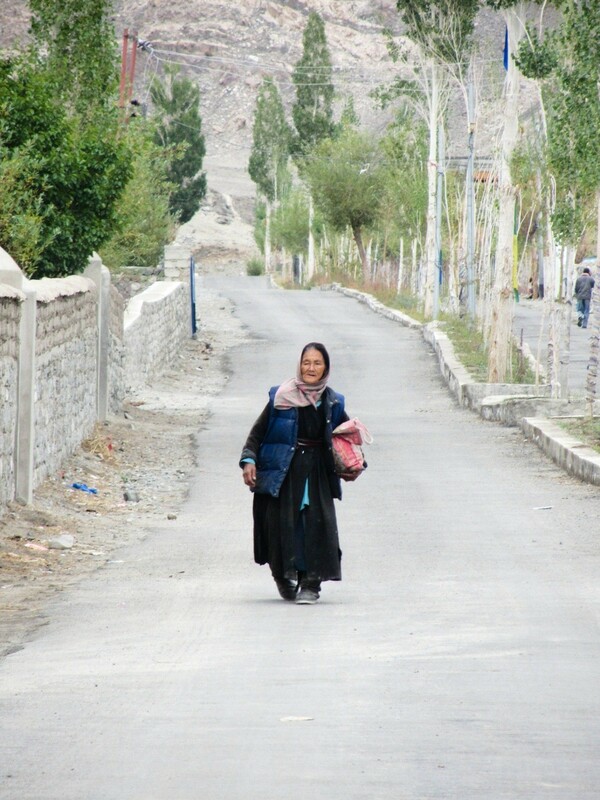 We started off from Keylong with sun laughing at us and also the roads till Jispa were buttery. 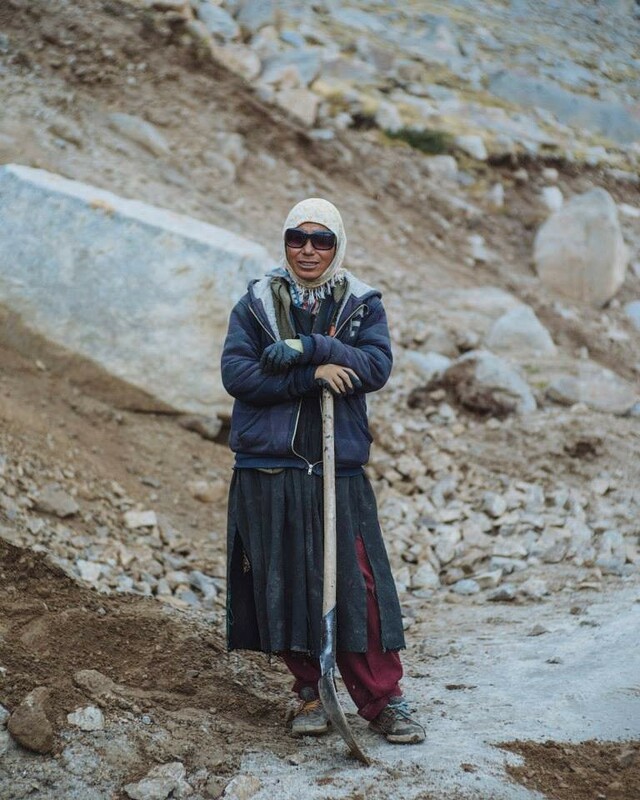 I took few pictures including a Ladakhi lady, who was so nice and willing to pose for a picture. And soon we reached Patio, a lovely army base which greeted us. It was so calm and perfectly placed that it was hard to tell it indeed was an army base. It was used in a famous Bollywood movie, it was Hrithik starrer Lakshya movie which was shot here. The movie till date remains one of the best movies and I personally never miss it whenever it is aired on television. Till now it was a perfect ride with barely any problem but once we crossed Patio and proceeded towards Bharathpur All Hell Broke Loose! Now I realized the importance of professional and good riding gear. All of a sudden it started to rain and the temperatures plummeted like a landslide from nowhere. And the worst was waiting for us, it started to snow!!!!! It was amazing experience on one side with the snowfall but my finger (index finger) started to feel the pain, thanks to a hole in my riding gloves. The cold slowly and steadily started to bite me and after sometime I could barely feel anything! 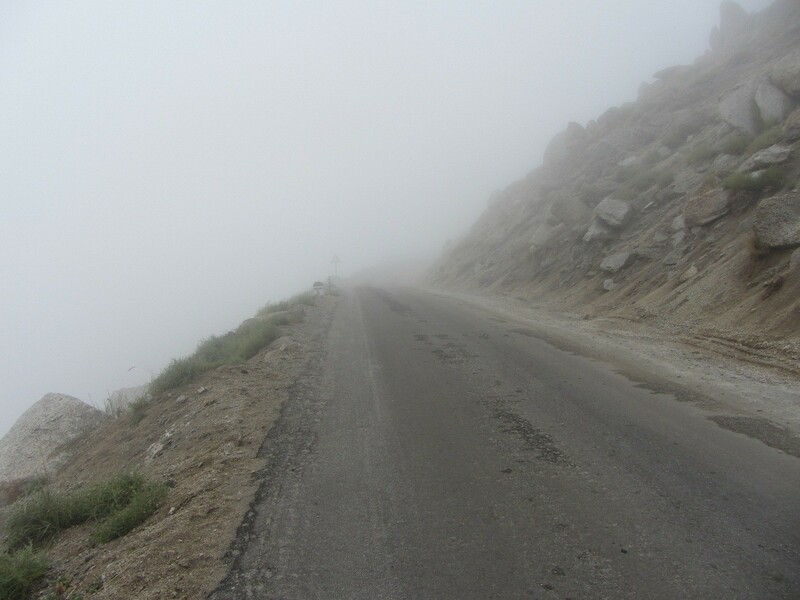 I had to slow down because of the visibility which dropped to few feet and even the sharp hair pin bend was not helping. Trust me I am not joking and it was one of the worst day of my life. (I said one of the, more was waiting for us!!!). The effect of riding with a damaged gloves stayed with me till I returned to Delhi. I could not afford to stop in that condition and somehow managed to reach Bharathpur where we all had fallen like dead bodies. To our luck hot Rajma Chawal was served in those tents which was like biryani and water in the oasis for me. After the meal I took a quick nap for few minutes and hoped we could settle down here for tonight. There was no question of continuing my ride with those gloves. 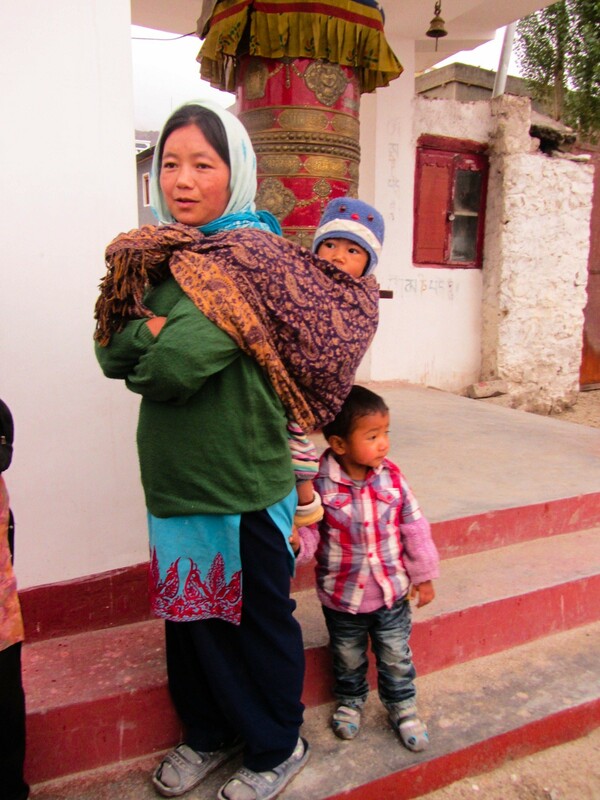 Luckily the Ladakhi lady at the tent gave me a pair of warm woolen gloves which was slightly overpriced. But then what is the point in having a finger which won’t help you in signing the cheque! After taking the gloves I still had a problem at hand and it was rain. 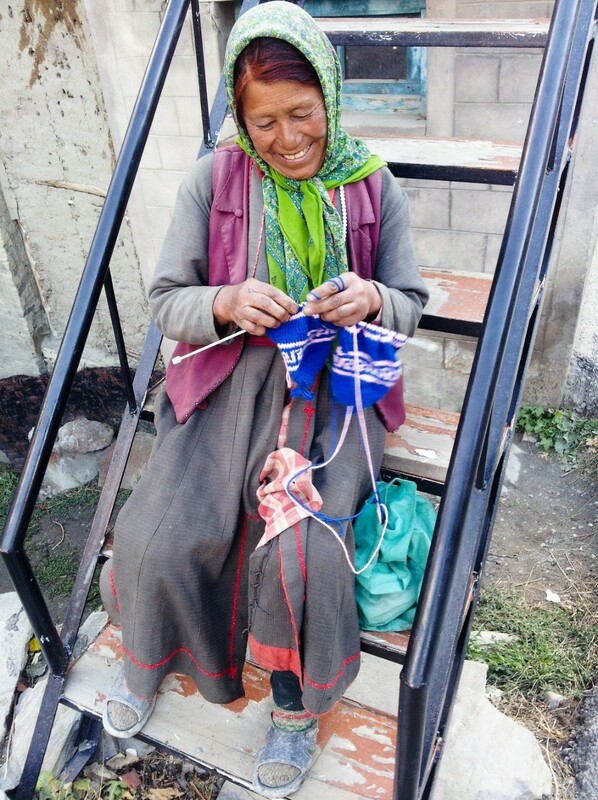 The woolen gloves would get wet in rain and that is the last thing I want which would freeze my whole hand The Ladakhi lady came up with an ingenious idea of tying plastic covers over it, call it Jugaad. No wonder we Indians are so famous and the West has borrowed this word from us. 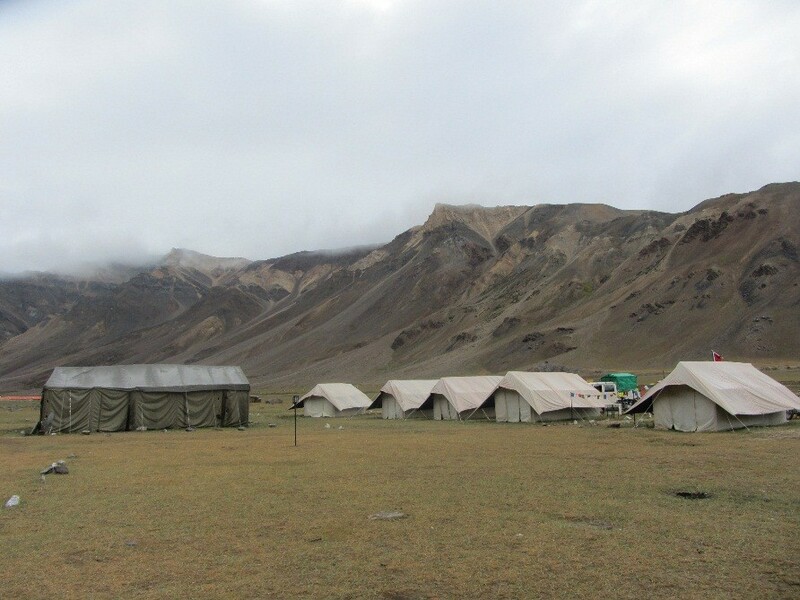 Meantime Mr. Sanjay reminded that the night stay was at a tent near Sarchu, the worst was not over. The rains refused to stop and we thought there is no point in waiting for the rain gods to have mercy at us. We left the tent with heavy rains on our heads and just went on and on till we could see the tents. I do not remember anything expect for stopping to check out my buddy Justin who was standing next to one of those metal bridges and the reason, one more part he had broken successfully. At that bridge Justin showcased his dirt biking talent again and ended up breaking the brake pedal. Yes the metal brake pedal. Now you can just imagine why I and he ended being the best buddies in this ride. 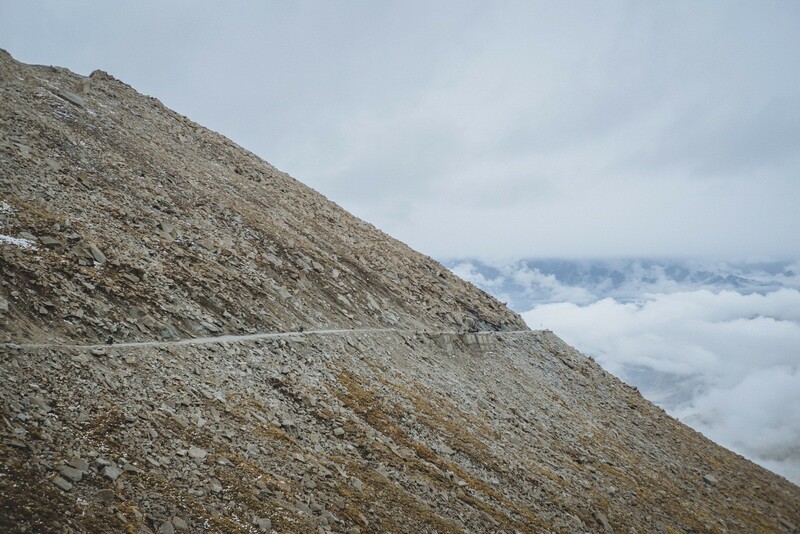 I just loved Justin’s way of riding on those unknown terrains with hardly anything to fear about and I equally hated him for breaking the parts. It was 17:00 Hrs in the evening when we reached Sarchu. I may forget my birth place but not Sarchu. And remember how I said this ride changes people and pushes them to the core? Yes it is here that I was pushed to the limits. Everybody headed to their tents and quickly changed the clothes. And once we were called for dinner I remember how everybody was shivering as though Godzilla was in front of them! And bloody AMS (acute mountain sickness) kicked in. 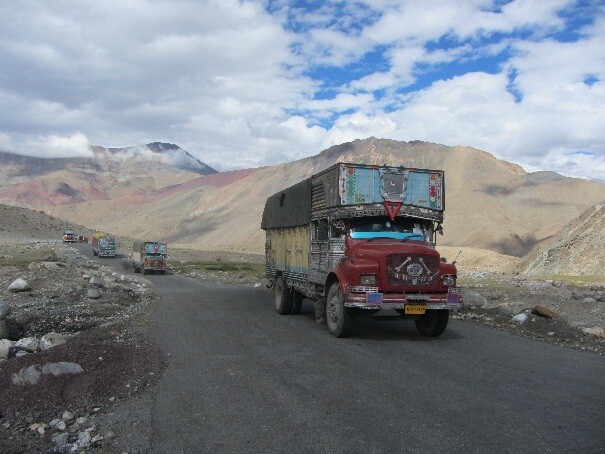 All the symptoms which are related to AMS were there and we realized only after reaching Leh when we Googled about it. The worst symptoms of AMS is that your head starts to burst literally and you lose the appetite for food. For a foodie like me, it was shocking to see that I barely ate anything and that too after a long and tiring day of ride. I just managed to have one single roti with great difficulty and went straight to bed. But this is where the worst part starts, the temperatures further dropped and to add to our miseries it was raining. The tents had small openings which were barely visible for us and the biting cold winds were penetrating our tents just like the bullets from the enemy. This can definitely be compared with the Chinese water torture. Some of the riders were clever who had brought few bottles of brandy with them after seeing the weather report previous night at Keylong. And couldn’t I do that? Nope, for the first time in my life I regretted being a non-drinker. And after sometime there was a point around 02:00 in the night when I almost walked up to my friend’s tent for a cup of brandy!!! Something inside me did not allow, my body was telling to have it and my mind was telling ‘no, no, no’……. guess who the winner was??? Yup somehow managed to sit through the whole night with three layers of clothes and three blankets around me. 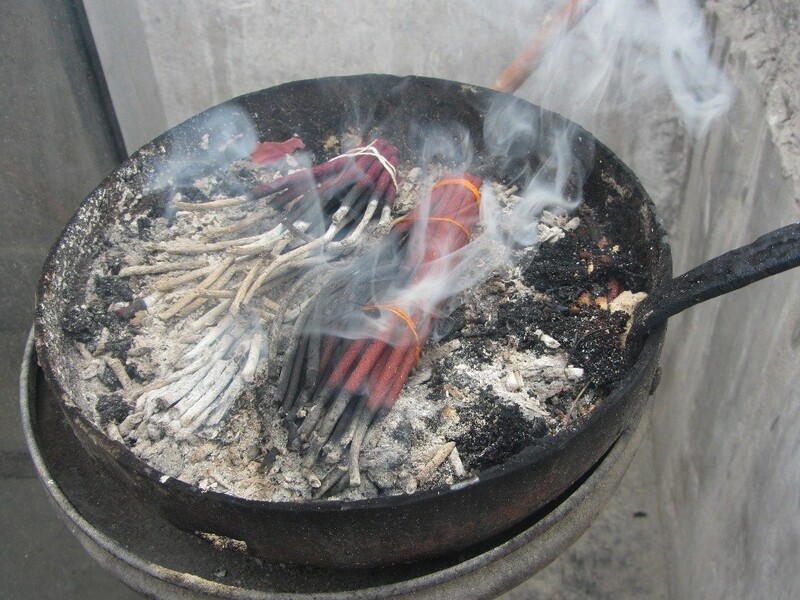 I literally remembered all the Gods and said to them, help me to get through this somehow…. 05:00 in the morning, rain stops and I fell asleep finally but only for two hours! 3rd September: Sarchu-Pang-Taglangla Pass-Karu-Leh Around 07:00 our guide walks in and tells, ready ho? I just gave a thumbs up and said 5 min! Quickly brushed and rinsed with few drops of water. How funny it was, even few drops of water in my mouth was giving me unbearable torture! Now just imagine this whole scene, worst day of ride in my life with snow, rain, biting cold, sleepless night and AMS. And just two hours of sleep post which again you got to ride for roughly 200 Kms! Talk of testing your limits? Here it was. I feel many will agree with me that, it is easier to manage lady’s mood swings but not Himalayan climate. Once I was out of the tent I could barely walk and was acting as if I had a bottle of whisky. The AMS loved me so much that it refused to leave and as a result I ate just one slice of bread. All the riders were on their bikes ready to leave. I was the only fellow who wasn’t there for the group picture. You can see in the picture below on the left hand side one bike facing the tent? That’s me…. Wish I had that cup of brandy last night! Anyways I did not have the luxury of staying back and rest for few hours. Luckily by now I and Justin had become close friends and we were there for each other right behind when needed. Just when everybody left, Justin walked up to me and asked, how are you? All fine? I said, can you be right behind me and make sure I do not fall? It was so nice of him to be there for me, when he could as well have left, especially with the sun shining bright and wonderful roads ahead. 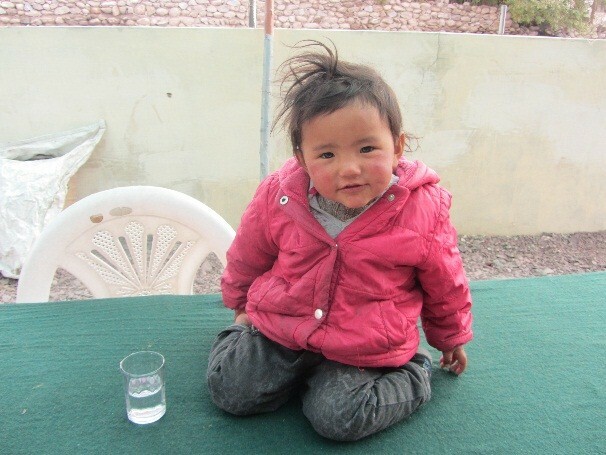 We said goodbye to dreaded place and were few kilometers from Sarchu when something real funny was happening. I was ripping through the roads and Justin was nowhere to be seen. As I figured it out later that there is something common between bike and a guy. Once they start, they refuse to stop! (Dirty minds, do not drift too much!). I forgot almost everything about the previous night, the AMS, the cold bite and my numb finger. The worst thing is that I ended up reaching first at our next stop, Pang. 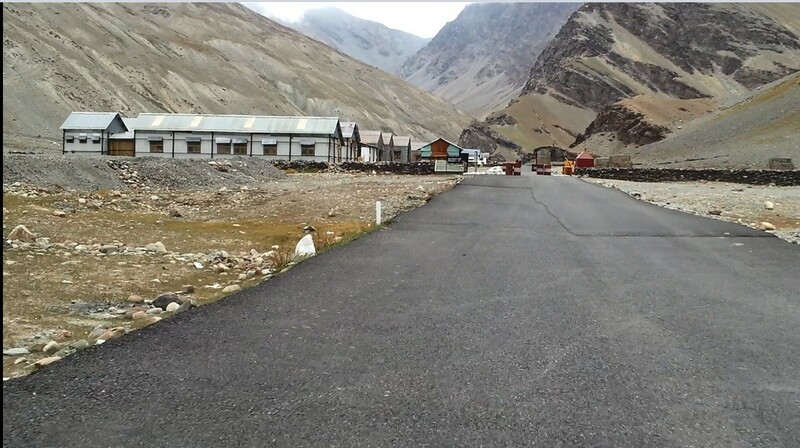 Pang is a small army base which is roughly at 15000 feet above MSL. 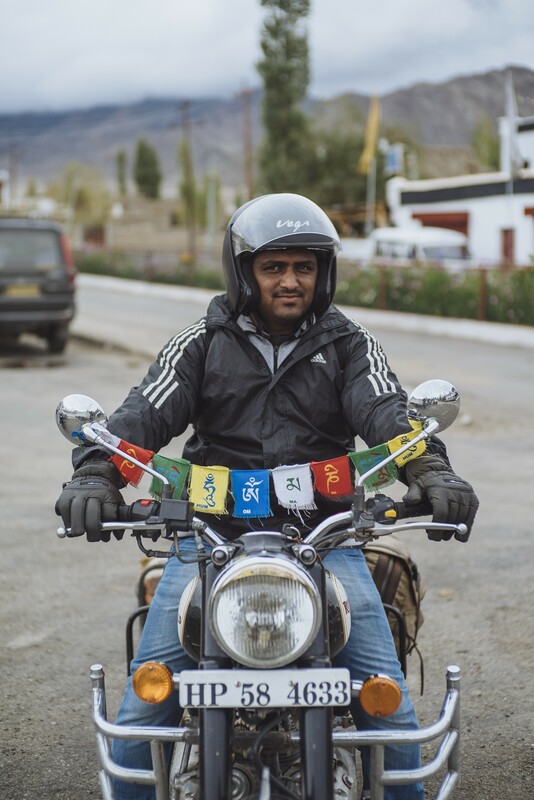 This is when my guide, Sanju walks up to me and says ‘do you want to race ahead and prove a point that you can ride fast on these roads?’ the tone was really scary and it was probably a warning to me. But I swear, there was something so blissful when I sat on the bike that my AMS almost took a backseat and I literally went on and on. Riding on my bike especially with those serene and staring mountains was making me forget my pain! It was transcendental to say the least. 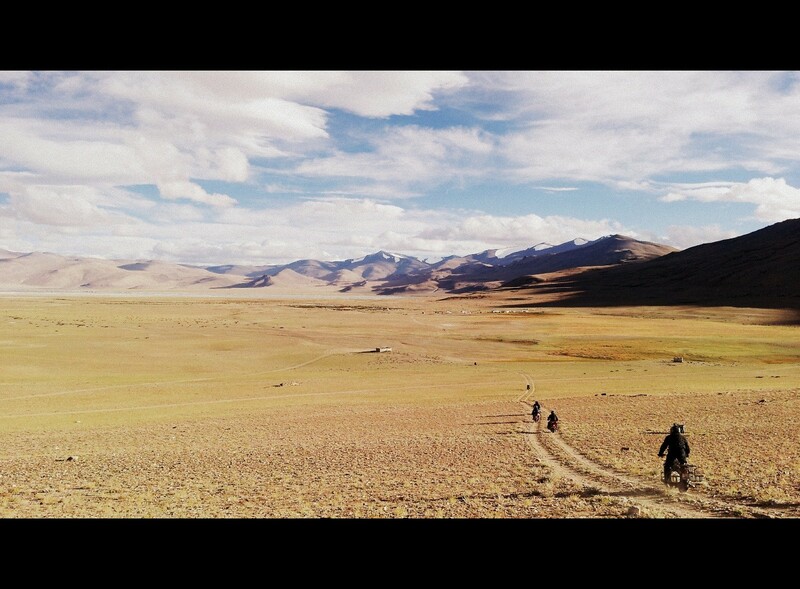 The remaining riders took some time to reach Pang and I decided to start off to reach Karu at the earliest. And OMG, the best roads out there in the middle of mountains was awaiting us. All the SH, NH (state and national highways) would be put to shame after seeing this stretch. My bike finally touched 120 on this stretch. As soon as we crossed the buttery roads, it was back to back-breaking roads. We could hardly cross 40 or 50 on the speedo. 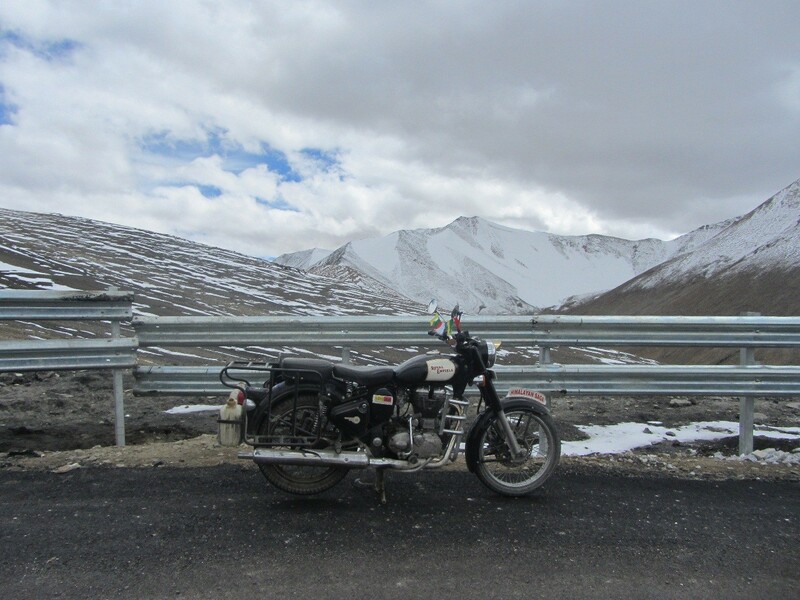 Then came the Taglangla Pass, where you are greeted with the snowcapped mountains. Took some snow in my hand to feel it. Ah the feeling was just inexpressible. 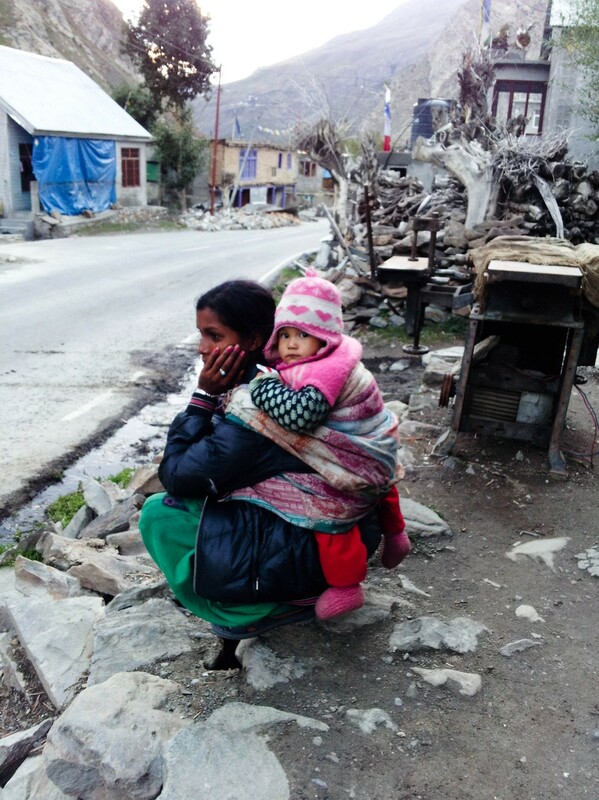 After Taglangla our next stop was Rumse, a sleepy village just 40 Kms before you reach Karu. 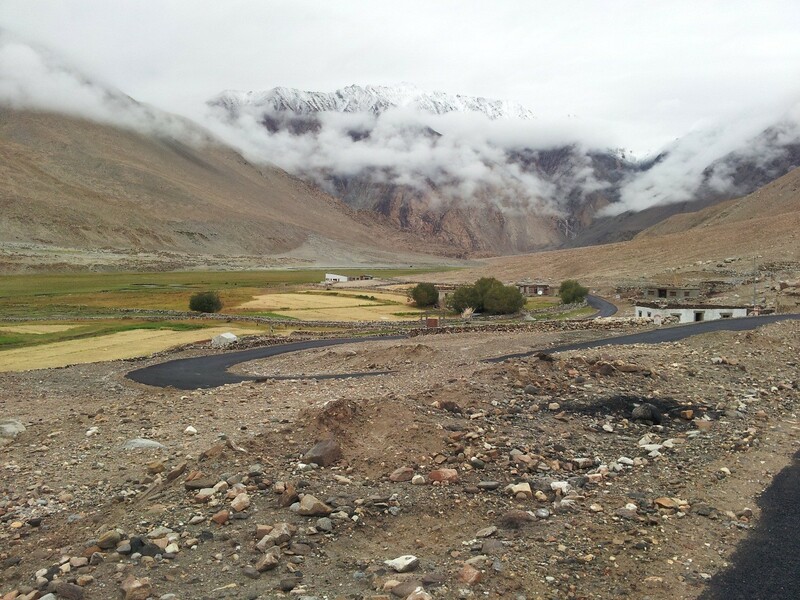 From Taglangla Pass till you reach Rumse (in fact till Leh) the roads are awesome. The roads run parallel with picturesque mountains and streams. 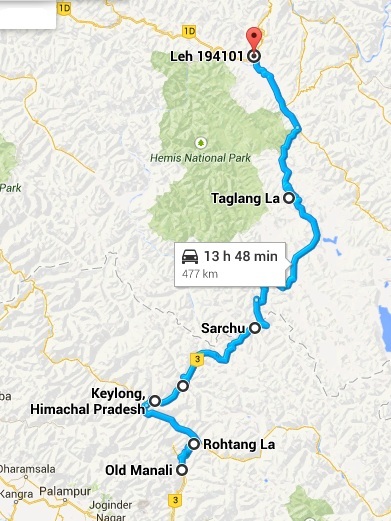 Especially when you get down from Taglangla till Rumse, the roads have many sharp corner and hair pin bends. One of the BRO’s (Border Roads Organization) whacky road sign greets you saying, I am curvaceous, take it slowly! Humor at 15000 feet above MSL with little oxygen running through your head. I reached Rumse first around 14:00 in the afternoon. I quickly made a STD call to my mom and brother telling I was alright and perfect. And this was a call which I made after two days, thanks to my choice of network. 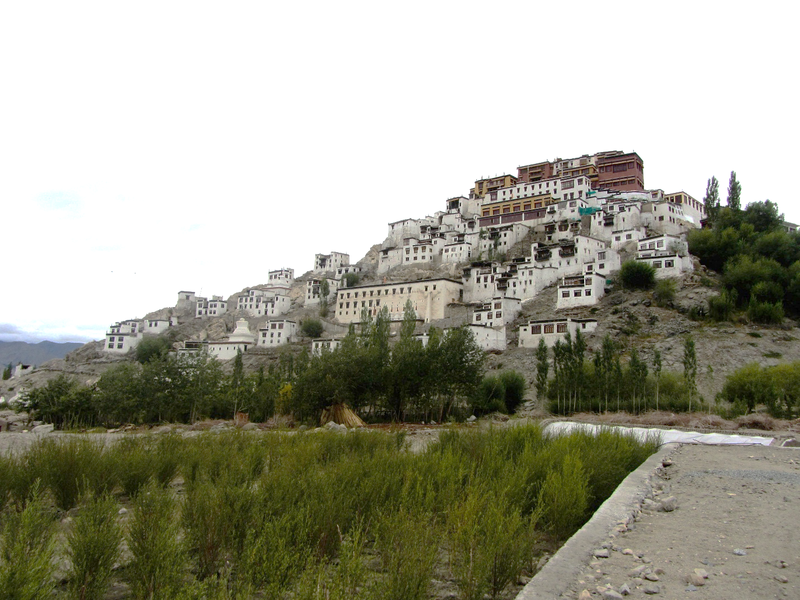 One more info for all those who are planning to visit Leh. Carry a postpaid BSNL mobile with you, none of the prepaid networks work here. After sometime everybody joined in and this time we had few more riders joining Justin. Peter ended up breaking his front tyre rim and Jason broke his silencer. I loved the sound RE made after the silencer came off. So did Jason! As soon as Sanju came he was staring at me furiously. I could understand his concern about us and how we were supposed to go together. But it was not possible for me to come at that pace, especially when my head was bursting whenever I took a break or had to wait. The only solution for me was to keep riding and the faster I went, the better I was feeling. I would not advice the same to all but in my case it was working. Our next stop was Karu, a strategic army location where our soldiers are trained for the high altitude conditions and then posted to Siachen. 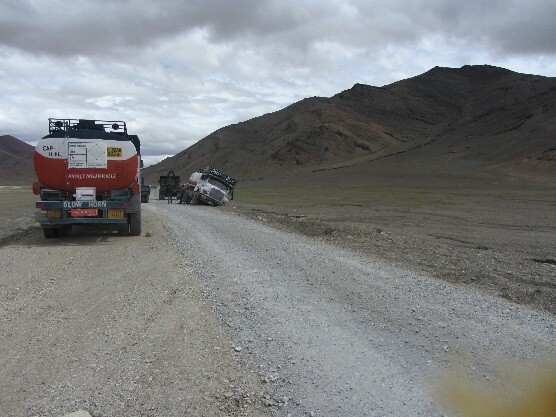 But our purpose of stopping was to fill our tanks which was the only fuel station after Tandi. 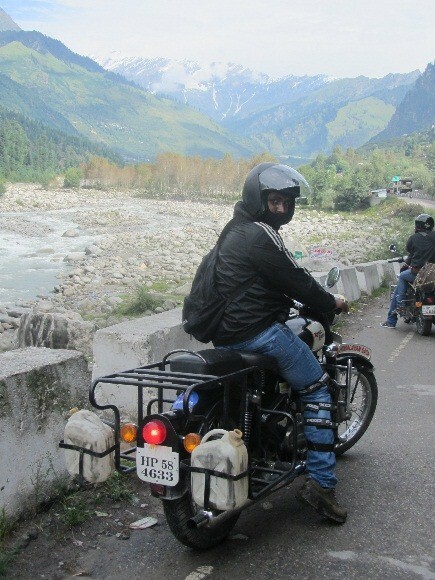 Everybody filled up their tanks and from there it was Mr. Sanju all the way till Leh. He strictly warned everybody especially to me and asked us to be right behind him so that none of us was lost in the Leh city. Later in the evening we did experience what Sanjay had said. Finally we reached Leh around 19:00 and checked into our hotel. I was so tired that I did not bother to change my clothes. Later pushed my body for a hot water bath and headed for dinner. Then at dinner Ankitha, one of the co-rider informed us about her husband, Biren’s birthday. She had ordered a cake and requested us to join for the midnight birthday celebration. Everybody was good to her and said yes! And when the time was 23:50 I came out to see if anybody was there, as expected none of them turned up. Hesitantly I just knocked the door and checked if Ankitha was awake, Biren bhai tho was dozing and he definitely deserved to. What a husband he was! All the ride and journey I explained so far he did with her wife at the backseat. Kudos to him for managing to do that………. On a serious note, I envy his spirit for riding at this age. Very few dare to do it. Oki back to his birthday, ate a piece of cake, wished him and then straight away I went to bed with Diamox….. (It is a pill for AMS!) 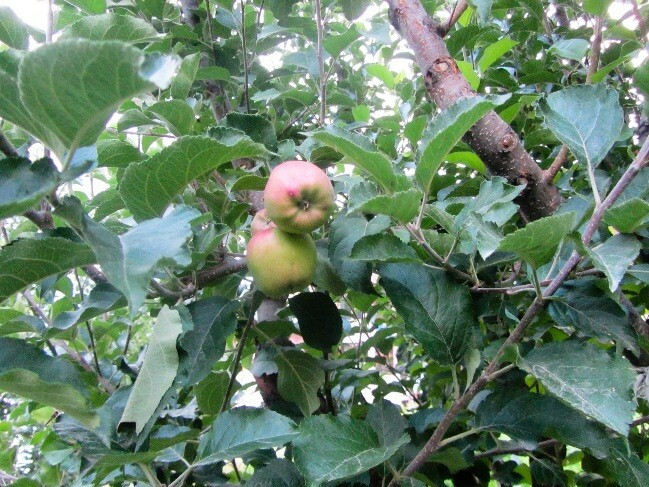 4th September: Leh-Leh! Our plan was to visit the world’s highest pass (debatable), Khardungla Pass and we were all excited. But unfortunately due to heavy rain and snow the roads were closed and we could not visit. 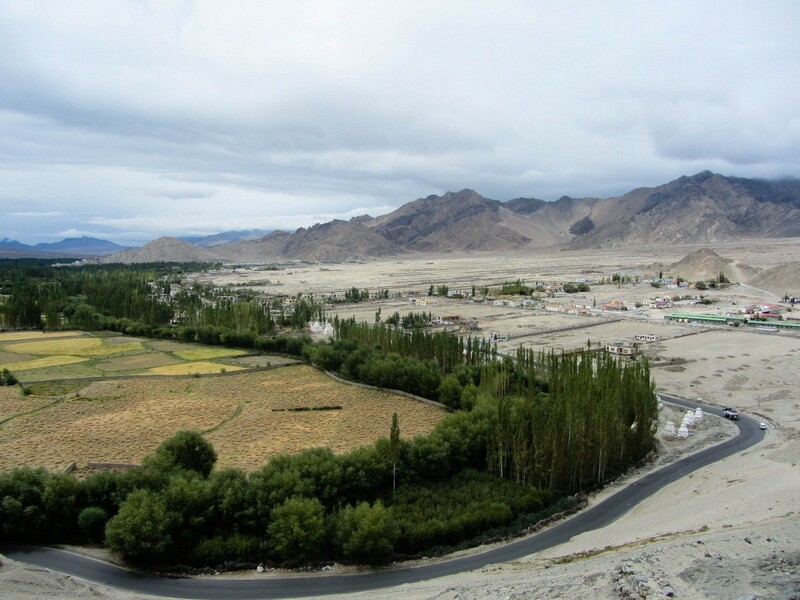 Sanju said we are free to roam around and visit the surrounding places in and around Leh. We had a big discussion and the groups had divided opinion about places to visit. 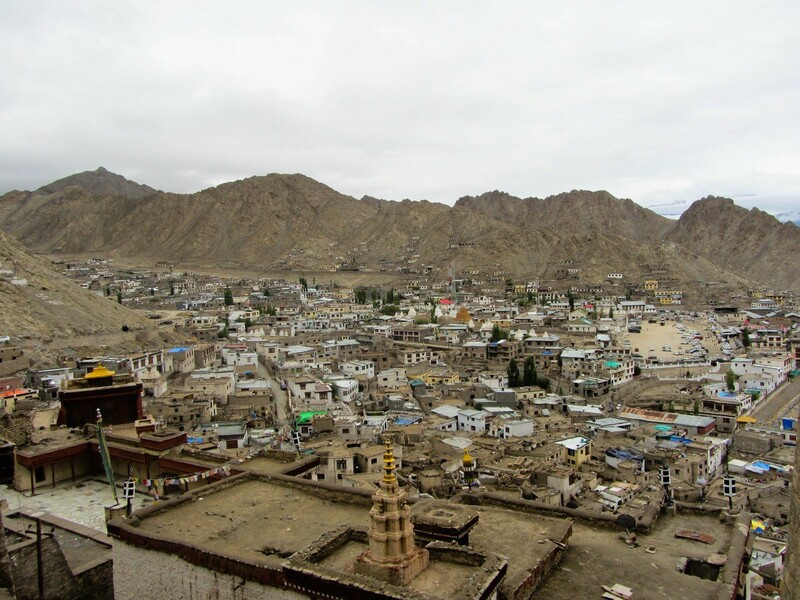 Finally it was decided that I, Justin, Biren, Ankitha, Pronoy and Souvik will visit the Shey Palace and then Thikshey monastery. 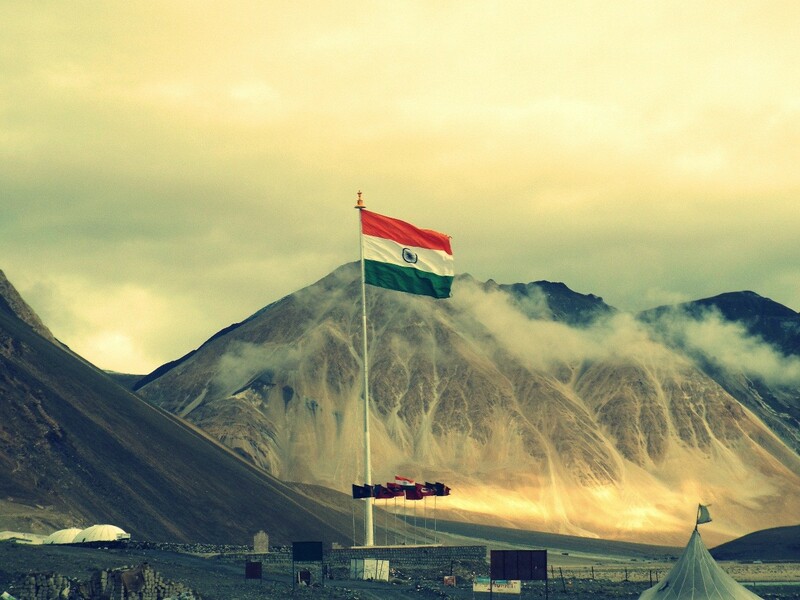 If time permits, will visit the magnetic hill and Kargil memorial. After a quick shopping we headed for Shey palace. Nothing much to see but I ended up with some good pictures. 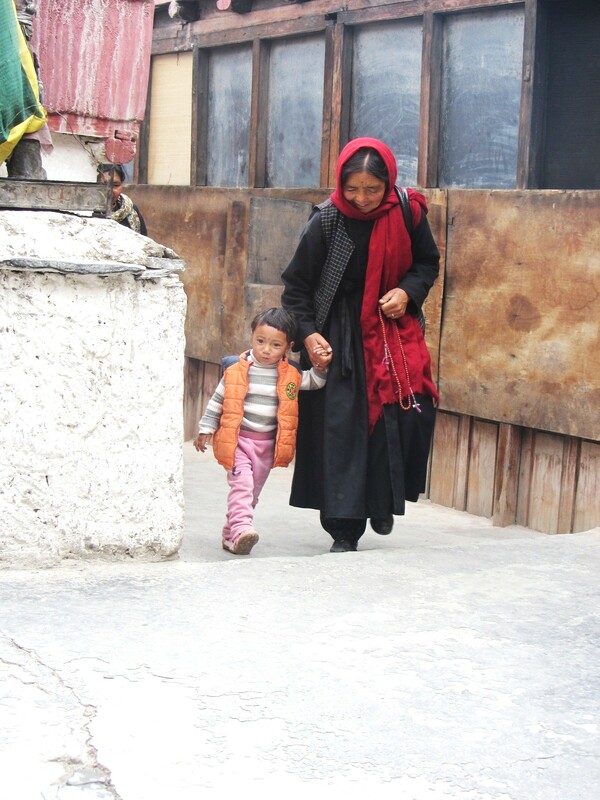 The best picture for me was the one where this cute little baby is with her granny. It came out so natural. 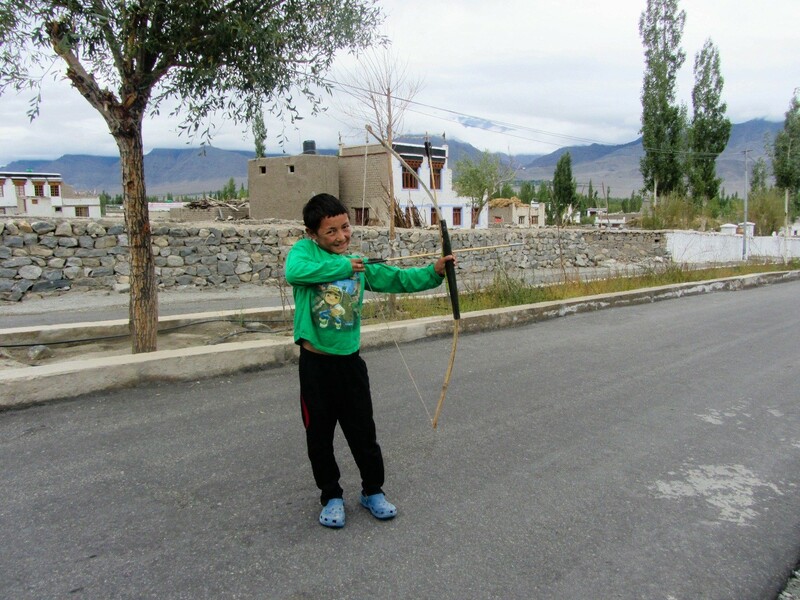 The little kid was definitely our Ladakhi Krishna, very naughty and jumping around. As we were coming down two more kids stood near our bikes and these fellows were asking for donation. It looked genuine for us and we did not mind giving few bucks out of our pockets. 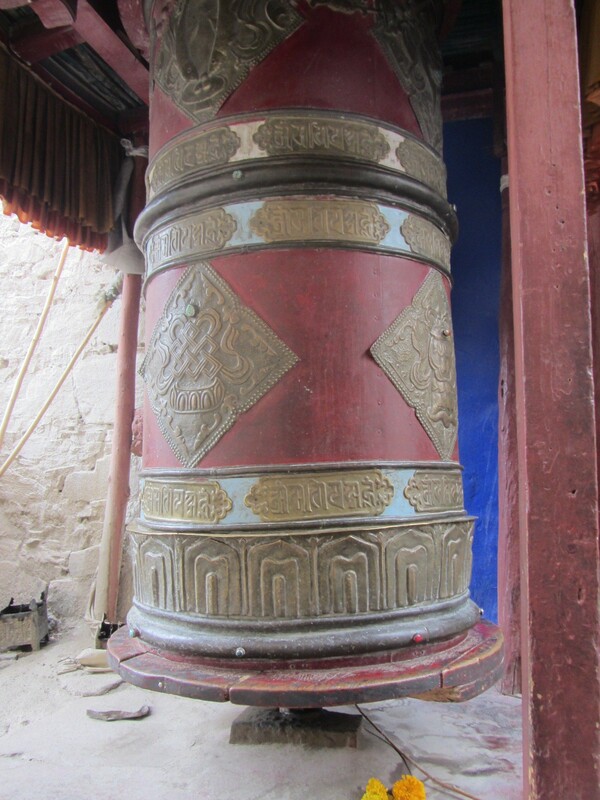 Then we headed to Thikshey monastery which was few kilometers from Shey. 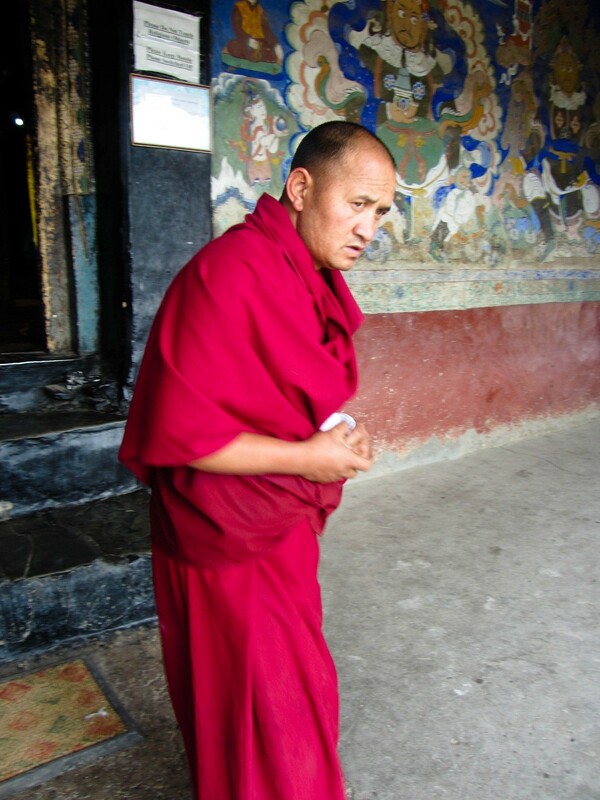 This was probably my first visit to a monastery in Ladakh after having arrived from Bangalore, thanks to Sameer. 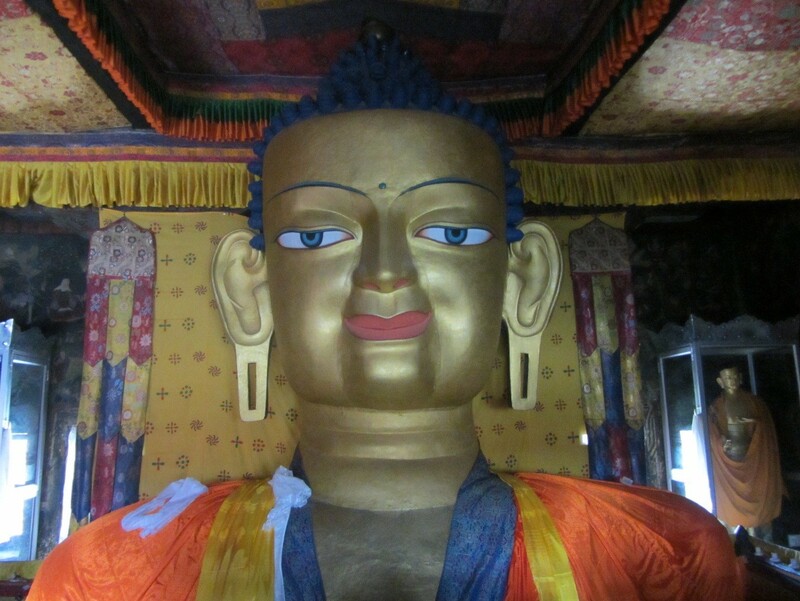 The guys at this monastery were so young and had a charm on their faces! They definitely can be in films. We spent some time at this monastery and by now we were very tired. Anytime I could have fallen down. Everybody badly wanted food. Good food! All the above amazing pictures made me to forget my hunger! But once done, my stomach started to cry again. We came down at the entrance of Thikshey Monastery near main road and found a wonderful restaurant. Lovely vegetarian food was served and we were so hungry that anything would have tasted good to us. Just as we were about to leave, my eyes fell on a granny who was walking on the street. Her walk was so majestic and something transcendental about her. I immediately pulled my camera and clicked her pics. Mr. Justin for the first time in his life was rejected by a granny!!!! This lady refused to pose for Justin and he was so disappointed not to have a picture of her. Imagine, a guy from USA with three bikes who is relatively handsome and yet the lady says ‘no’….. ! But definitely there was something about this granny. The way she walked was so graceful as though she was making a statement. It looked to me she was telling, ‘here, see even at this age I am roaming and walking proudly on the streets without anybody’s help’….. Or maybe she was in a hurry to visit her granddaughter or grandson! 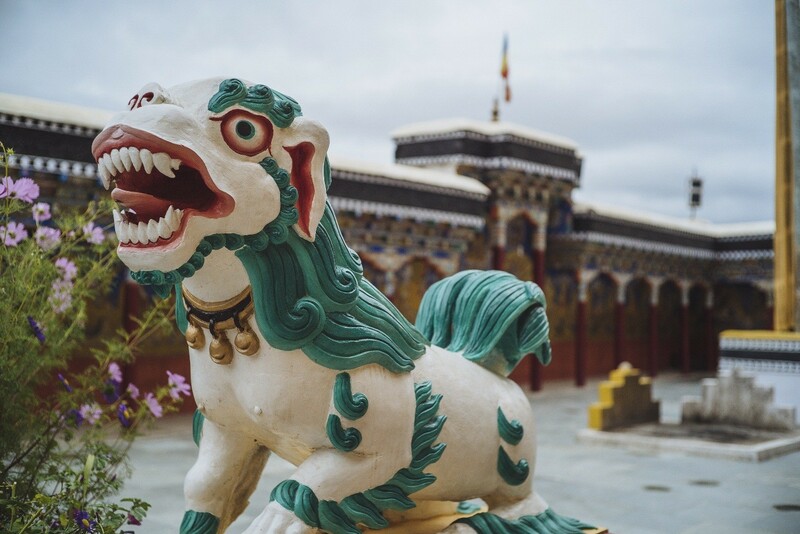 On our way back we visited Leh palace, which is quite misleading with its name and I am sure many would be disappointed equally. There was anything but just plain old building with barely few things in it and it was called Palace! Suddenly I was reminded of our very own Mysore Palace! I was so damn tired that I was sitting outside and left Justin, Sameer and others to do the sightseeing. On our way back to the hotel Justin, Sameer and myself decided to take something back home for friends and family. The very first shop we entered turned out to be the best and got all our gifts at one go and at a good discount. Sometimes my name (Hussain) does help! 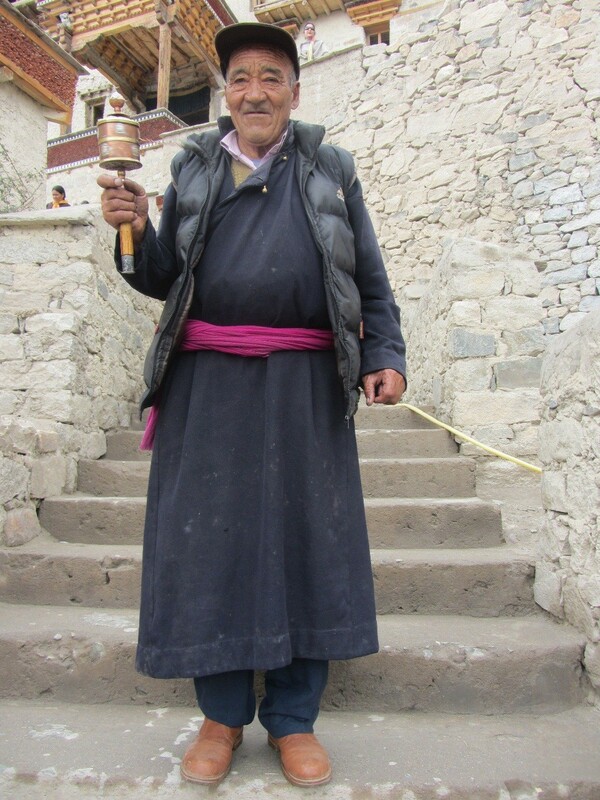 I took a singing bowl and prayer wheel as memento while Justin had a list with few items and Sameer did not like anything. We went back straight to hotel after the shopping. The dinner turned out to be good and soon after dinner I was back to bed with my partner! 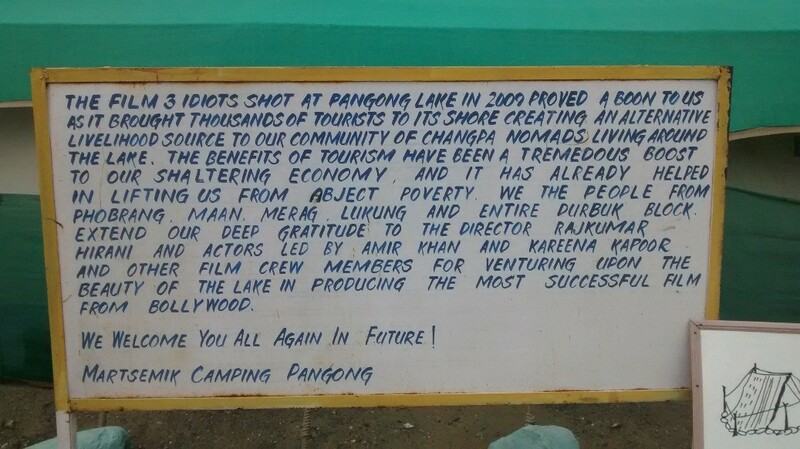 (Diamox…) 5th September: Leh-Pangong Lake The previous night most of us dreamt of Mr. Phunsuk Wangdu aka Rancho from the famous cult movie 3 Idiots. 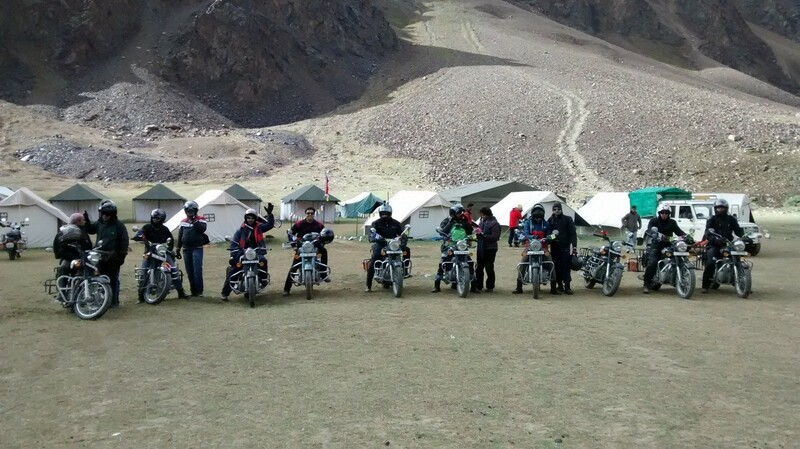 Everybody was on their toes to kick start the bike and rush to Pangong Lake. This lake is famous for its bluish water surrounded by serene mountains. 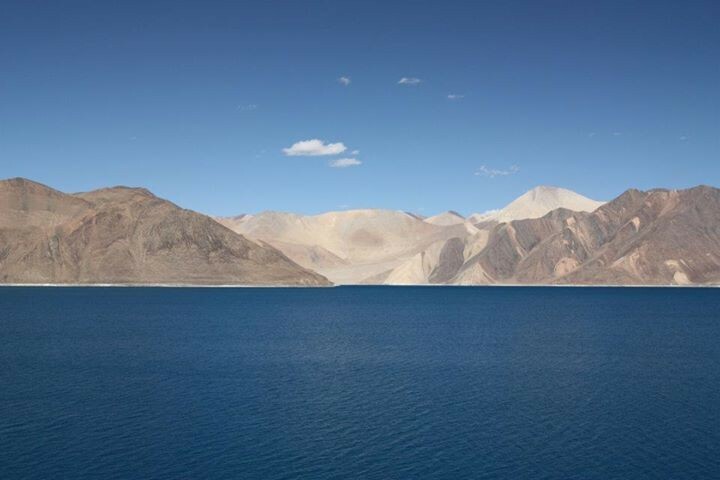 These mountains and the lake have become so popular that first thing any tourist asks after landing in Leh is 3 Idiots lake. Since we had visited Shey and Thikshey previous day we had the privilege of going ahead and reach Karu. At Karu there is a shopping complex which is run by the army and you can get some good gift articles to carry home. Since I was very hungry I decided to have breakfast and right above the complex we had a food canteen. And what a surprise and delight it was for me after visiting this canteen. There was Dosa which was served at a very reasonable price! Dosa is a famous South Indian breakfast food served at almost all restaurants and rarely does anybody miss it after visiting south India. The other interesting thing was, that the army soldier serving it was our very own South Indian with whom I could speak in Kannada. 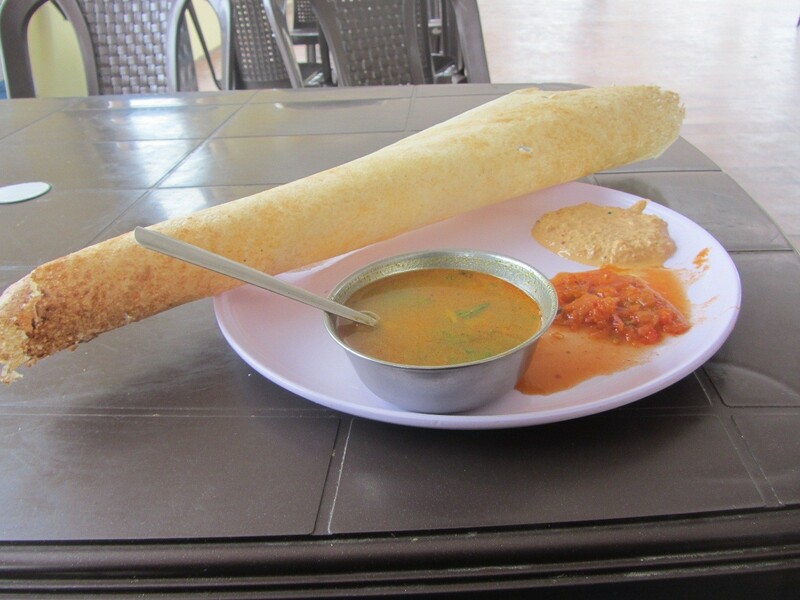 After almost 10 days, here I was uttering Kannada words….the excitement was so much that I ended up eating two full dosas (these are really big dosas). Complementing the dosa, we had coconut chutney and tomato chutney, both delicious. We were so engrossed in eating that most of us forgot about Sanju who had reached Karu and was waiting for us! He found us and literally blasted for being late. 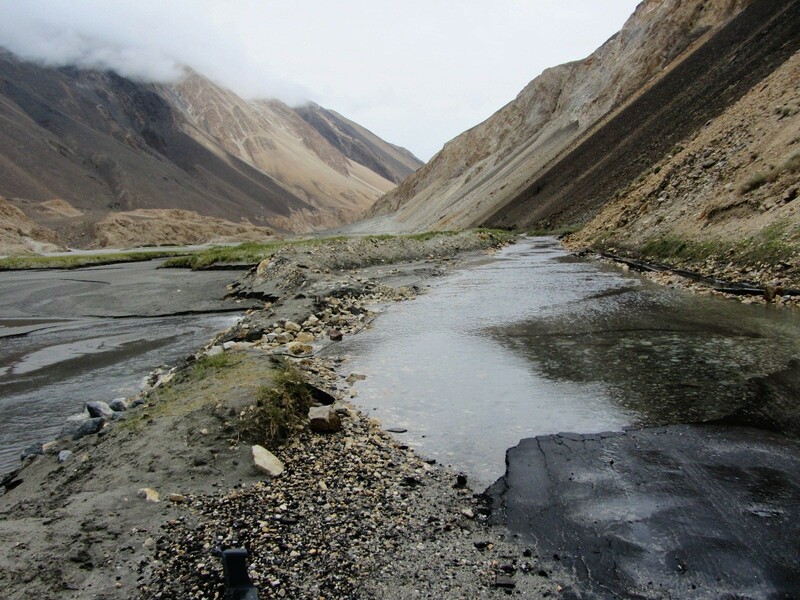 From Karu one has to take a left to reach Pangong Lake. I guess Sanju forgot to inform or caution us regarding today’s ride and the roads. OMG, people say ‘nature has its own way of teaching things’, yes this is so true on these roads. Once you cross Karu, you are greeted by roads which keep flip flopping. You first run through a wonderful patch of road and then you are greeted by clouds! Yes you would be flying in the clouds where the visibility drops to few feet and then suddenly from nowhere like a Cheetah in forest you end up seeing big army truck right in front of you! It is so bloody scary when you see our Indian army trucks on these roads where the entire stretch is occupied by it. That’s when it hit my sleepy head that I had to switch on my fog (tiny bulb right next to headlight) and the indicator light. One special word of caution regarding these roads, which I should have mentioned in the beginning itself. At the sharp corners or bends you have to honk as much as you can. It might seem funny till the 99th time when you honk but that 100th honk which you miss and later find a huge truck coming at high speeds, you will tell to yourself ‘holy crap’ and then it is The End…. That happened to me and I was almost knocked down by one of the BRO truck. Thanks to that truck driver who quickly pulled to his left and I am alive to write this blog. Ok continuing with the roads, once you are done with this cloud flying you are greeted with rough patch of roads where landslides are common. And if you have a rough day then it snows, it did snow for us. 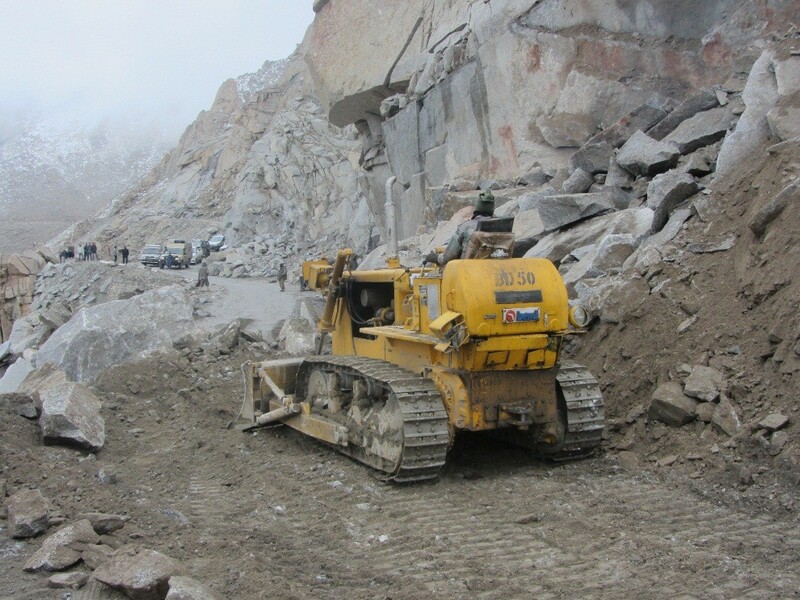 Luckily the army’s earth movers were there like a Genie and quickly cleared the roads for us. Once you cross this stretch, you get the buttery roads and what a delight it was to be back on our seats!!! I was enjoying riding on these roads like a wild horse and then suddenly my bike stops. The engine refused to start even after many kicks! I was gutted and hated this especially after such a horrific ride. Luckily Justin was right behind me and tried to help me out but my bike wouldn’t start. Then thanks to Biren bhai who stopped after seeing us and took out his toolkit (my bike did not have a toolkit) to remove my spark plug. After cleaning it properly and putting back the engine finally roared. From there it was super-fast mode with lots of road to cover. I guess only the wild horses could have overtaken me. 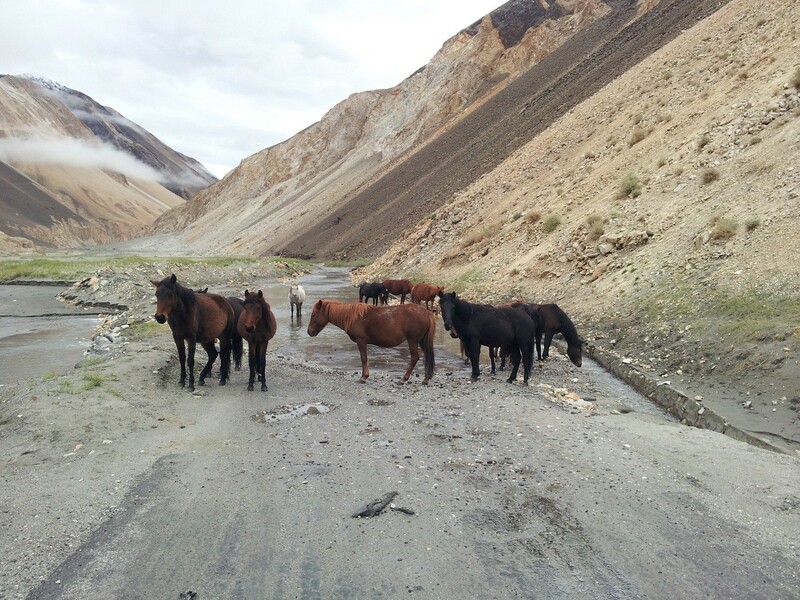 And yes we were forced to stop because of the wild horses which refused to give way. And I had to take my shoe off for the first time (not to sho them…) but to cross a water stream. My Woodland shoes weren’t waterproof unlike other riders who had gum boots with them. This was the only water stream where my bike was forced to take a bath. Once we crossed the stream which was so adventurous we came across a place which was dominated by the Marmots. 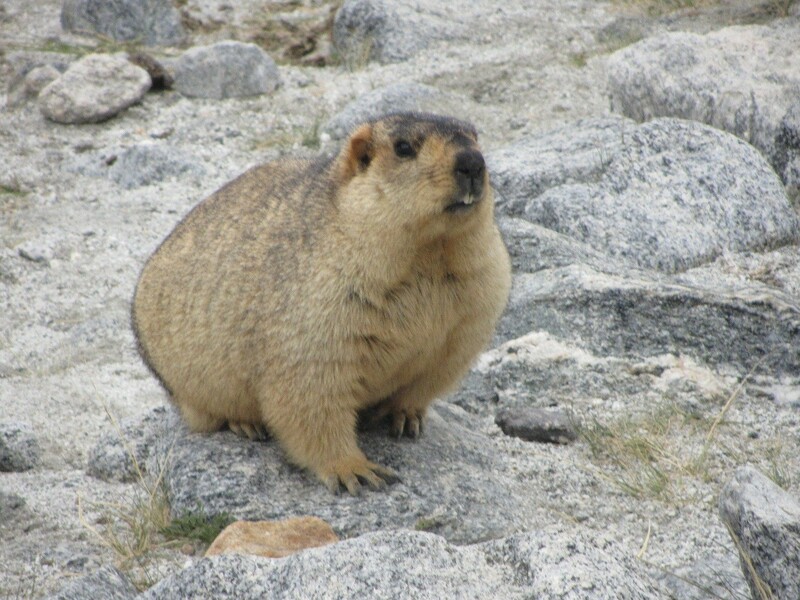 These Marmots are small creatures which are very friendly and even pose for photos but do not try to feed them even if they come close to you. 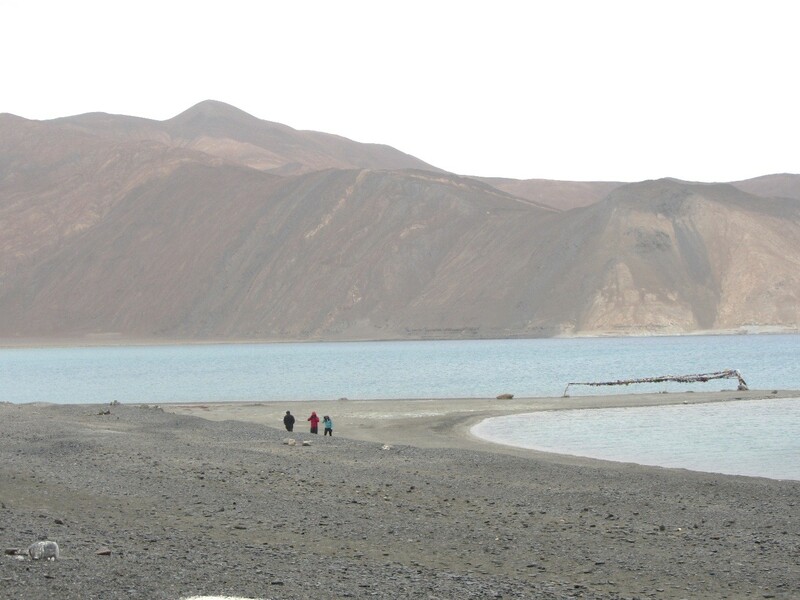 After few clicks we headed straight to Pangong Lake and from a distance I could see the lake! As we approached the lake, I was greeted by a giant Indian flag fluttering right in front of the lake. Masha ’Allah, what a scene it was and gave me Goosebumps. For a second, I forgot everything even the rain which had started just then. As it had just started to rain Justin and I decided to visit the lake and take few clicks. We could not afford to miss the chance after such a seesaw ride. 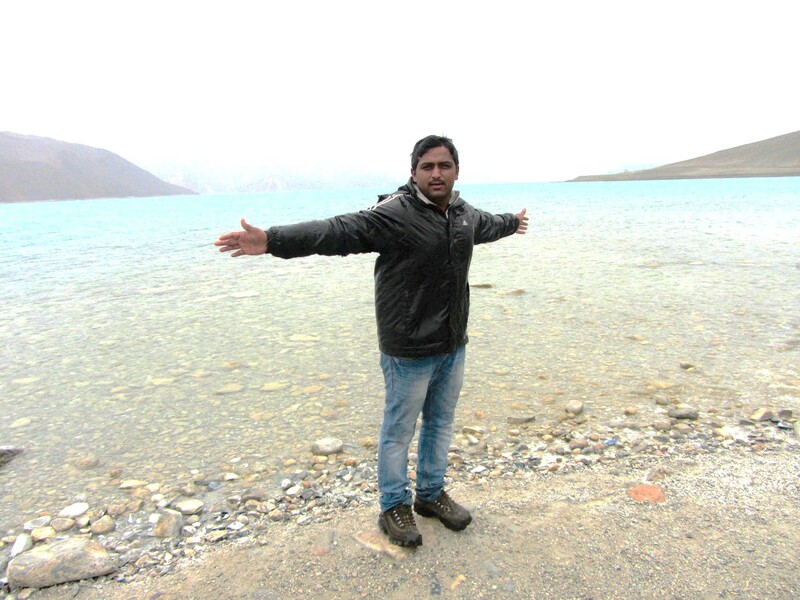 Even though it was raining, the feeling of standing at Pangong Lake was amazing and it felt so great. As though a moment which we would never experience again. It was pure magical moment with light drizzle and mountains staring at us. Ever since I saw this lake in the movie 3 Idiots, I badly wanted to visit the lake and here I was finally having done that. But one thing we regret is not seeing the blue color which is possible only if the sun if out. Unfortunately we had to compromise with Mother Nature. Some of the pics below will show the joy we had after visiting this lake. We probably had the best dinner at Pangong and were lucky to watch the cricket match after a long time. It was India vs. England T20 match live on Star Sports. Justin was curious and wanted to know how the game was played. I am sure by now he knows more than me. 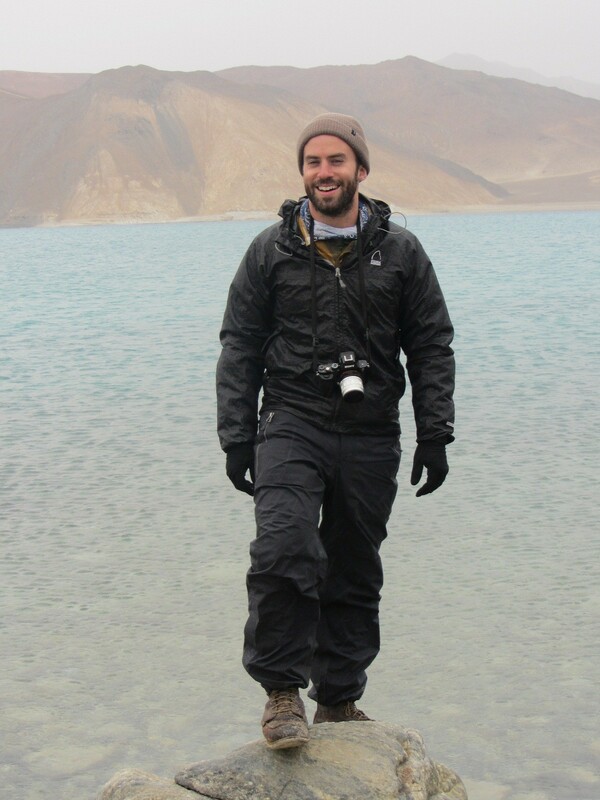 Around 22:00 it was time for some sleep and after so many days I had the best sleep…… 6th September: Pangong Lake-Tsokar Lake From Pangong we started off early to reach Tsokar Lake. The roads till Changla were excellent and we reached Changla in no time. Just before Changla you get a small army base where the army offered us tea not just to us but to all the travelers. There was something which I noticed and this was happening quite frequently and I guess it had become a routine for most of us. It is worth mentioning here. No matter who you are and from where, almost all the riders passing by would greet us. They always raise their hands and say Hi. Or probably All the best or Happy Journey or as simple as Julley! I just loved this part and it had become a practice that we all unconsciously would rise our hands. 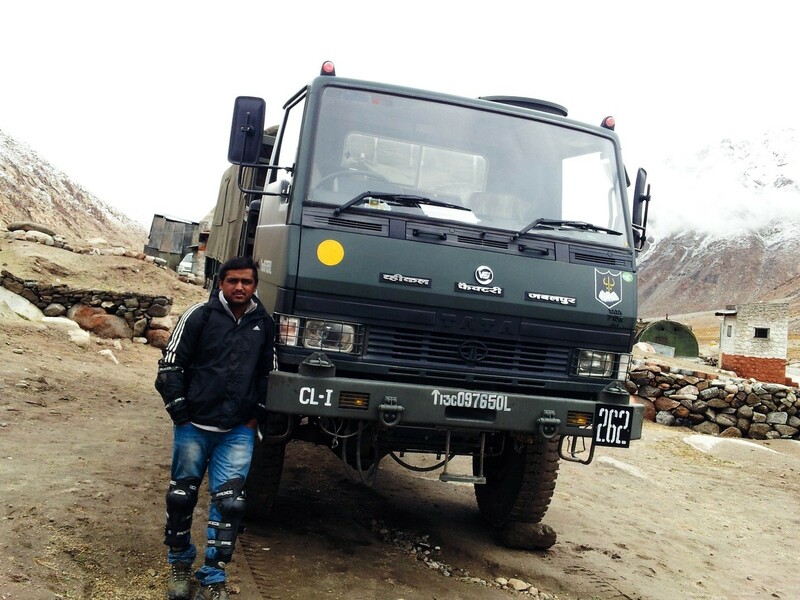 After crossing Changla Pass it started to snow….. And bloody one of the truck guy splashed snow onto my face. My visor was up due to snow and the rain which made the splash even worse. I was blank/blind for almost 10 minutes and stood aside for some time. I had watery eyes all along and to add to my miseries the invisible roads were waiting! Somehow I managed to pass through them and ripped across the roads as fast as I could. 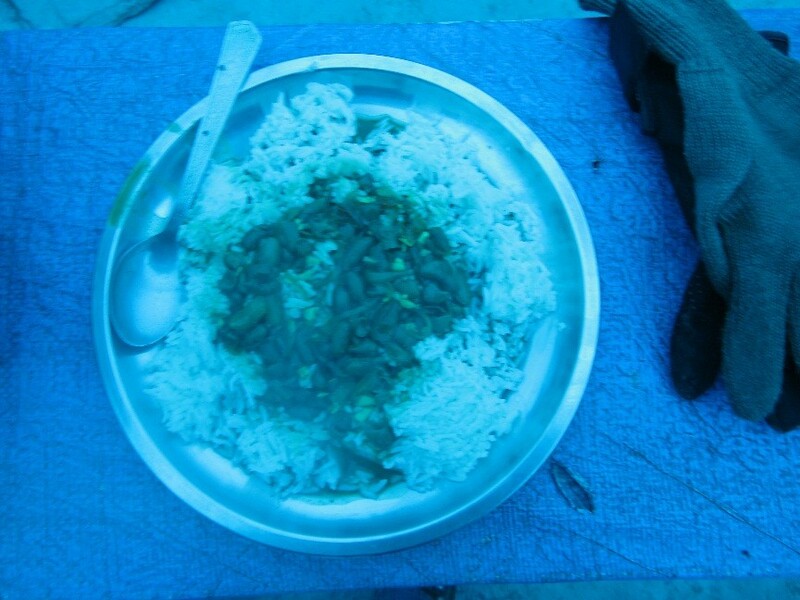 Later around noon I reached Karu and took Justin to the same army food canteen. We had dosas and this time even Justin like it. After the food we were waiting for others to join us. From Karu we had to trace back the same route and had to take a left deviation just before Pang for Tsokar. It was déjà vu as we came back the same route and just before Taglangla Pass we were lucky enough to witness even the fireworks by BRO. The road widening work was in progress and a blast was to happen, as a result we had to wait for some time before we were allowed to cross. From there on it was back-breaking road till Pang. As we reached Pang there is a short deviation which leads to Tsokar Lake and we reached the lake around 16:00. 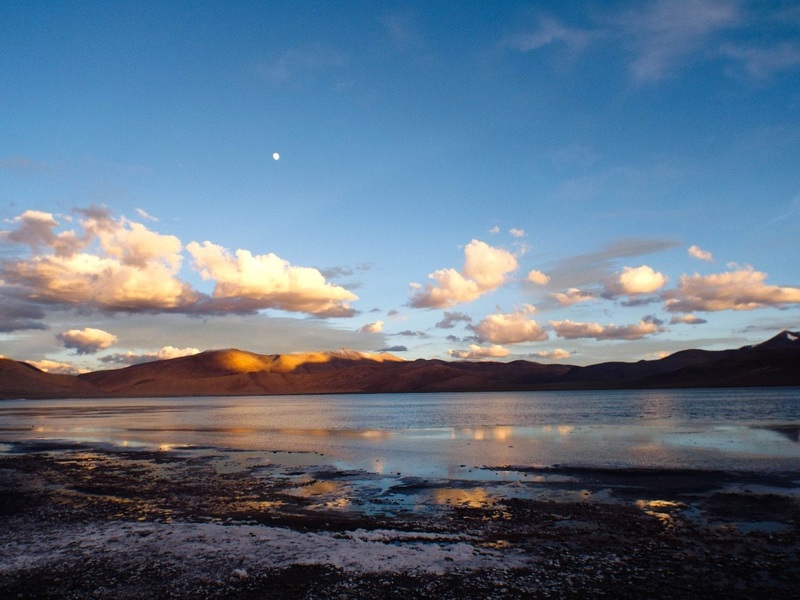 If any movie was shot at this location, then definitely Tsokar Lake would be as popular as Pangong Lake. The road leading to the lake itself was inexpressible. 7th September: Tsokar Lake-Jispa It was as usual an early morning ride and Mr. Sanju was literally kicking everybody out of their beds. After all the packing, we left at 09:00 with a bright sunshine and cool breeze accompanying us. The roads till Pang was perfect as I had mentioned earlier but after Pang it was back to the back-breaking roads till Bharathpur. By now most of the riders hardly had any patience to take pictures or even pose for it! The only thing on our minds was to reach Jispa before rain gods caught us. The roads were so bad till Bharathpur that Peter (Australian) lost his iPhone and passport, thanks to the regular undulations. Somehow he managed to trace back his passport. From Darcha the roads are wonderful till you reach Jispa and I just couldn’t resist it. I crossed Baralacha in no time with the experience of snow on back of mind. I touched my right index finger and it tried to say ‘screw u’! but failed to do so. The numbness was still there and there was very little I could do. I reached Jispa by 18:00 and had to wait for the luggage jeep for my bag. I decided to explore Jispa and took a walk with Sameer and Justin. Some wonderful pictures….. Finally the jeep arrived and I got my bag. Later at 20:00 we were called for dinner and I was so happy to have a good dinner. I finished my dinner in no time and went straight to bed one last time with my partner, Diamox….. 8th September: Jispa-Manali We were almost nostalgic by now with the entire bike ride coming to an end. Today was the last day of our ride and by evening we would part ways with our respective bikes. I was curious to see the reading on my odometer and it really did surprise me. It read 1200! That is almost a month’s quota in my city drive. 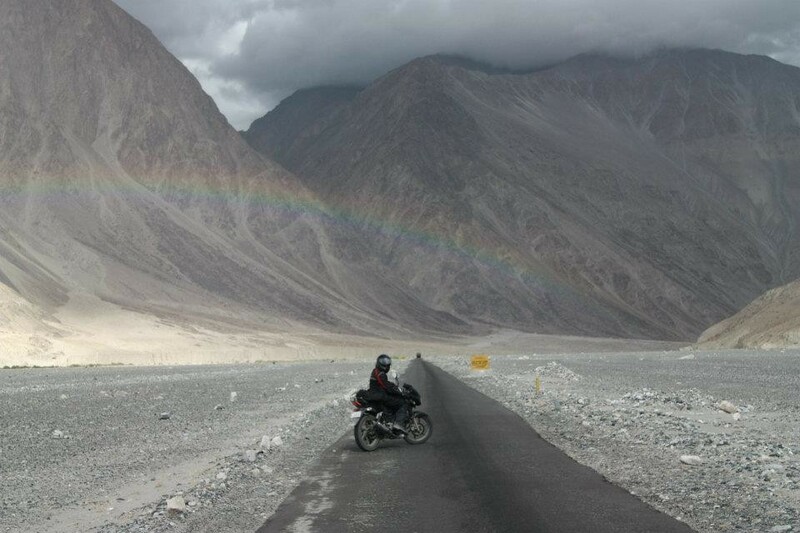 1200 kms of pure bliss, 1200 kms which we would probably not see again in our life. I looked up and the sun was smiling at us and we said thank you. Looking at the weather, most of us put our rain gears in the bag and wanted to enjoy the ride with bare minimum gear. But later we realized that the sun god had a surprise in store for us. The stretch till Sissu village was pain but after that till Khoksar the roads were a delight to ride. 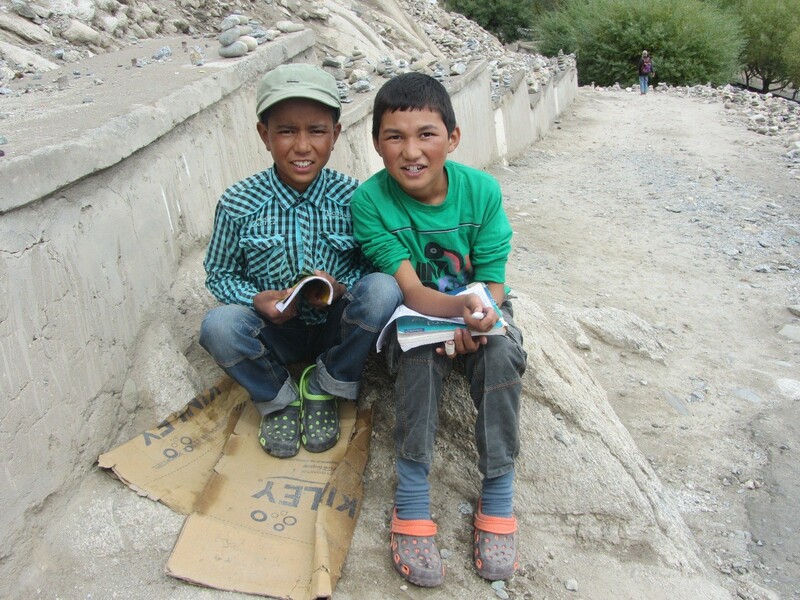 I and Justin reached Khoksar first. We decided to have our lunch and meantime wait for the other riders to join us. We both had a good lunch and then there was a surprise for me. Justin out of nowhere or rather out of blue tells. ‘I would like to give you my helmet’…and this helmet isn’t a normal one. 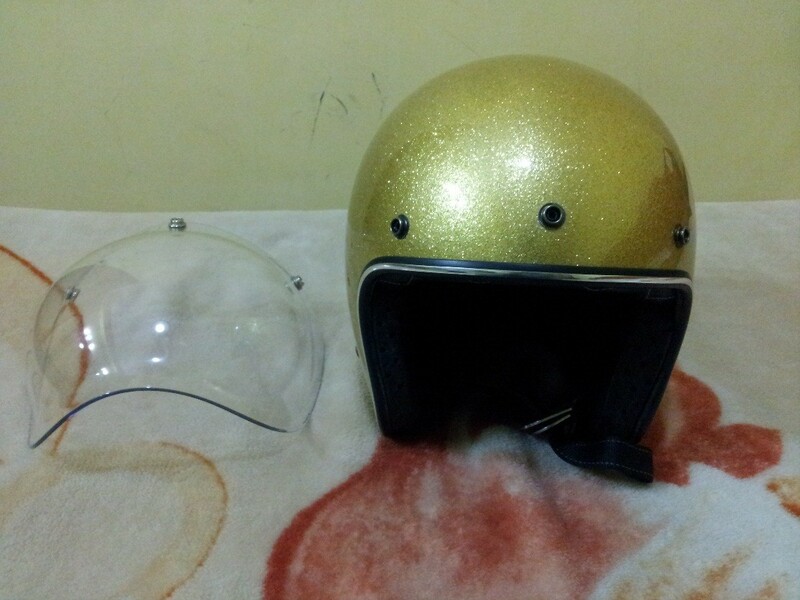 It is a DOT certified, golden color, open face helmet. Yes, Golden Color! And that’s where the name of my blog came from. I just loved it the moment I had seen on Justin. I still don’t know why he suddenly decided to give me. When asked he said, ‘I like your riding style and would like to give this helmet’. I had no words and all that was running in my head was, what do I give him????? That’s when I was reminded of my Swiss Knife. 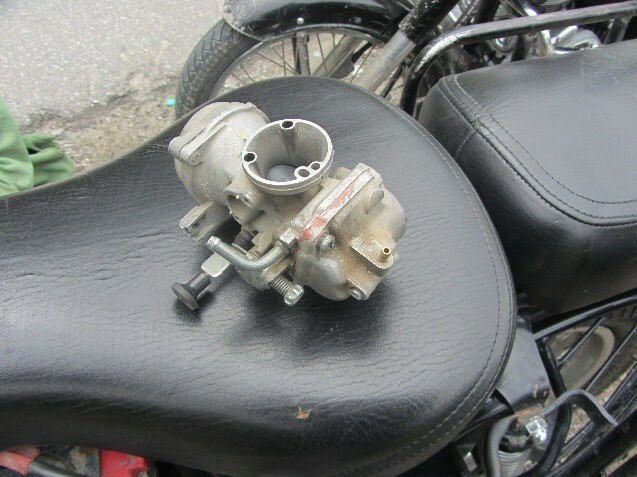 My Swiss knife was helpful to Justin in metering his carburetor on our way to Leh. And that also helped me to get my new 12-tool SAK. After a good lunch we stepped out to leave and the rain gods said, ‘Hello! And what awaited us after that lunch was the worst ride with all possible difficulties that one could get on a ride. To start off, it started to pour and then landslides. And as we started to move, bloody mud deserts!! Yes a funny word, but we had to encounter the small patches of mud deserts where one could hardly move his feet (read, Tyre). Don’t know how, I and Justin managed to cross it. My bike was half sunk in that mud. Even a dirt biker expert, Justin found it difficult to ride and had slipped. To add to our miseries, it was uphill all the way till Rohtang. On the way we found two trucks toppled and that again delayed our ride with many cars making a long queue. 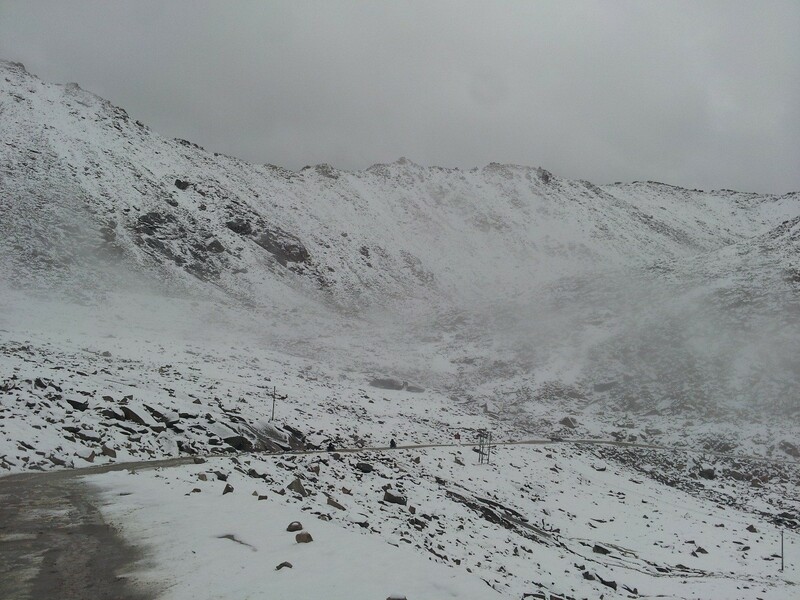 Managed to squeeze out of that queue and finally reached Rohtang, where we were greeted by biting cold winds. From Rohtang it was all but over and the next 50 km were the last on this ride. 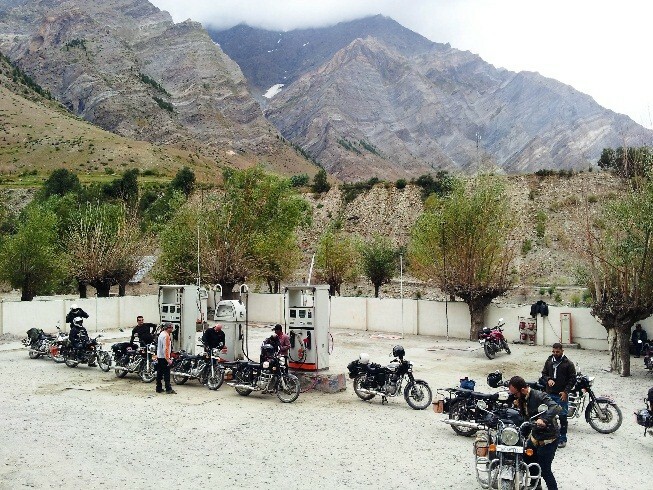 I reached the same petrol station at Manali where we had filled our tanks on Day l of the ride. Later, I was joined by Justin and Harpal. Harpal’s bike seemed to have a problem and refused to start. Somehow we managed to push it for few kilometers but later it failed. We parked it at a shop and proceeded to our hotel. Finally, around 17:00 we reached our hotel and we were all excited that the dream was finally fulfilled. It was like ‘Mission Impossible’ (at least for us) and we had successfully completed. We were safe and had returned in one piece. It was a mixed feeling for me and also for most of them. On one hand we were happy about full filling our dream and striking it out on our ‘To-Do’ list but on the other hand, we felt bad that the journey was over. We had to say good bye for our 12 day trip and also our bikes. Maybe it was one of those moments where you heart is in two pieces, one is happy and the other is sad!!! But I guess one journey ends for the beginning of the other. Maybe something is awaiting, maybe Bhutan or even California! That night we all had a wonderful dinner and went to beds with sweet memories – minus Diamox! 9th September: Manali-Delhi We woke up very late and I could see my woodlands shoes staring at me for not cleaning it. I got it cleaned after all that it went through. We had our breakfast and it was time for sharing and copying all the pictures and videos. It took almost 3 hrs for us to copy and finally I had to stop after my stomach started to growl. Right opposite to our hotel we had a wonderful multi-cuisine restaurant and we did not hesitate to hog. Our bus to Delhi was starting at 17:00 Hrs and we had to leave the table. 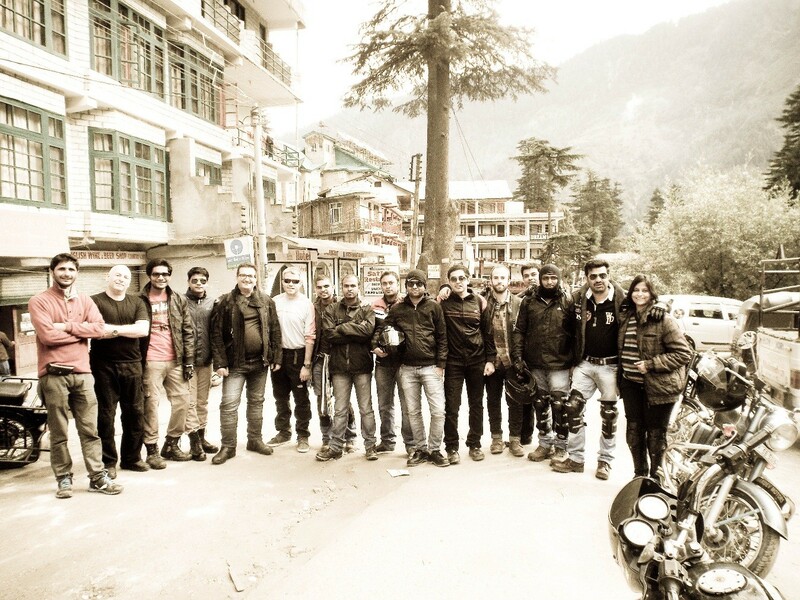 We finally said goodbye to Manali and our once in a life time experience came to an end at 17:00 Hrs. 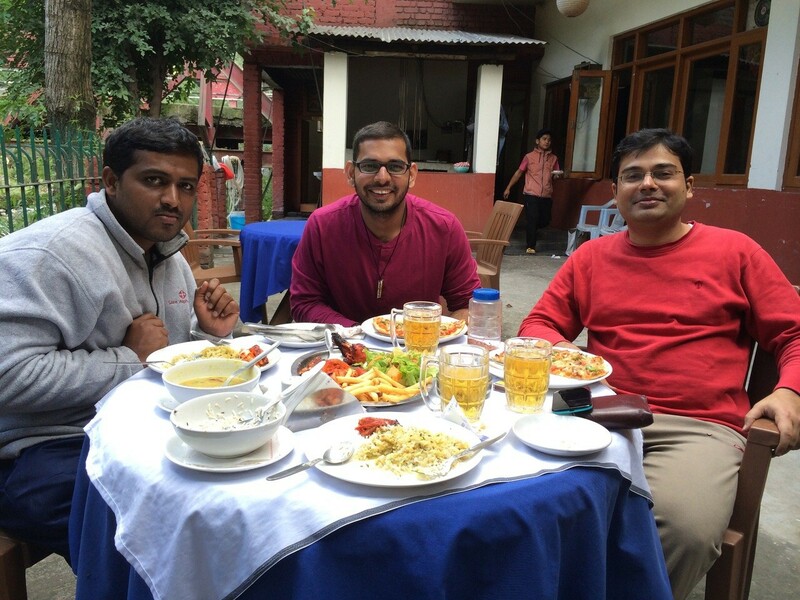 except for Mr. Sameer, who wanted to stay back and enjoy Manali for one more day. The bus we were travelling in had a good collection of movies and I chose to watch Fast and Furious – 6. This movie definitely helped me to overcome the ghat sections where one is prone for throwing up. Next day early morning we were thrown at Delhi and back to the hustle-bustle of city life. 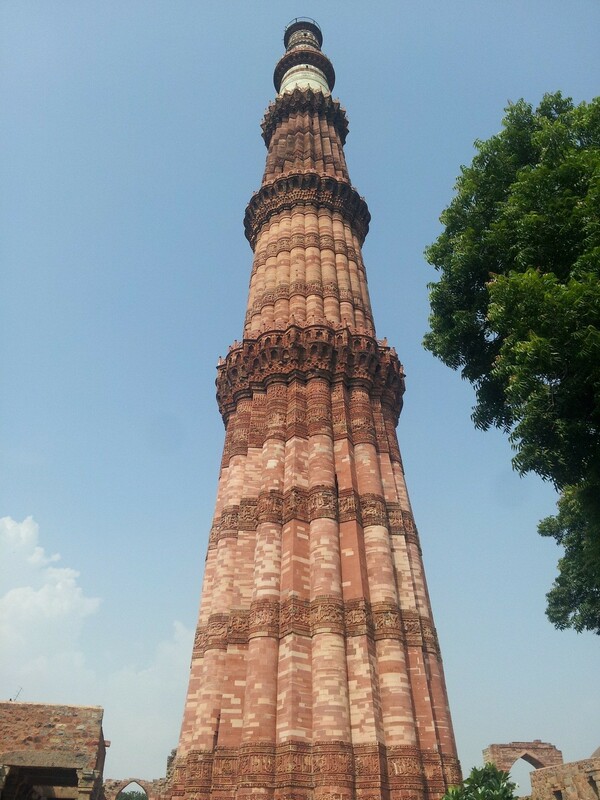 I was lucky to have Justin next to me, who had plans of sight-seeing Delhi. So my trip did not end. We covered some wonderful places in Delhi and I took Justin to Kareem’s (famous restaurant in Delhi for foodies) for lunch. 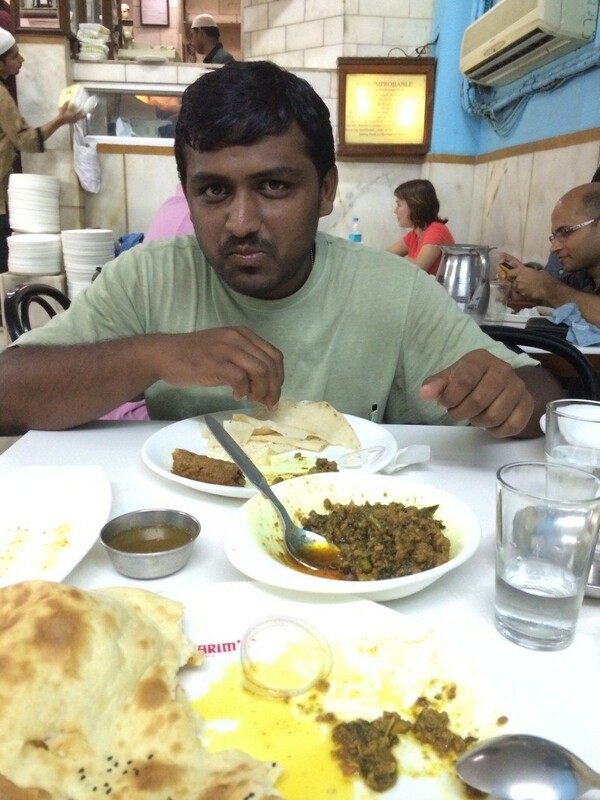 I ordered Kheema roti and later mutton biryani. Hmmm no words…….. Visit once and you would appreciate it! We finished our Delhi sight-seeing by evening and checked in at The Park hotel. I had very little time before I could catch my train. I got fresh and it was time to say bye to my best rider/friend, Justin. My train was at 21:00 Hrs from NDLS and the distance from the hotel was hardly 3 Kms. I took an auto-rickshaw and reached station. 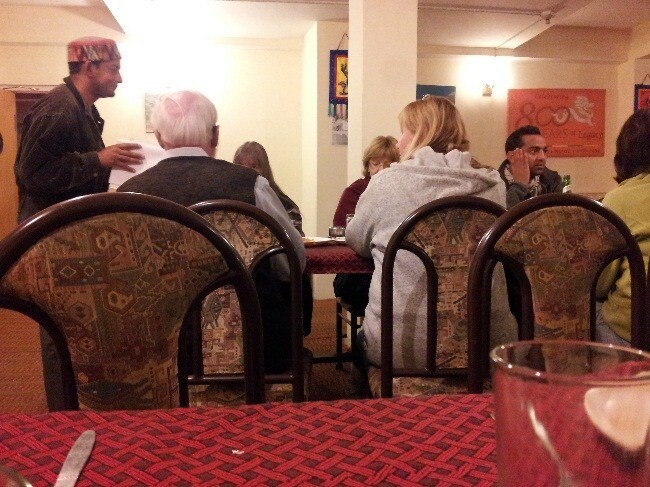 Tried dinner at a small hotel in front of station and it turned out to be very bad. My memories were very strong and I just forgot about the dinner. I reached one hour before the scheduled departure and you can as well guess what happened to me for the next one hour!! I was so bloody nostalgic about the whole trip. Everything started to pass by me, like a super-fast train gushing in all those wonderful memories of the ride. Just then a lady asked for time and it was 20:50 Hrs. I took my bag and entered the compartment. I quickly touched my right index finger to see if it was back to normal and it was! Finally the train left at 21:00, on time and I had to say goodbye to Delhi and also my AMS. My compartment was really disappointing especialy with the fellow travelers. The lady (married) asked if I could swap the upper berth seat for lower and I was more than happy to do so. Again I was least concerned and two days later I was back to office. I swear, I wasn’t the same person (at least physically)!!! Thanks to ‘how I got Leh’ed’….. Thank you for reading my blog, completely! Appreciate your patience! 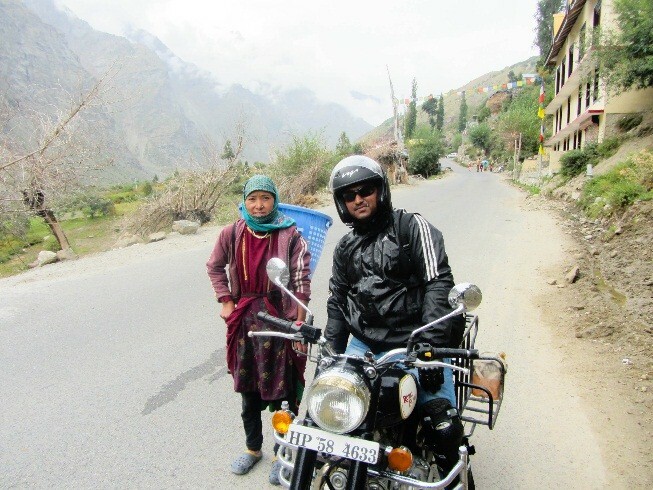 Special thanks to my buddies, Sriranjani and Mihir for reading my blog again and again to correct the mistakes……..
My colleague Poornesh for lending his riding gear and making my ride a lot safer. 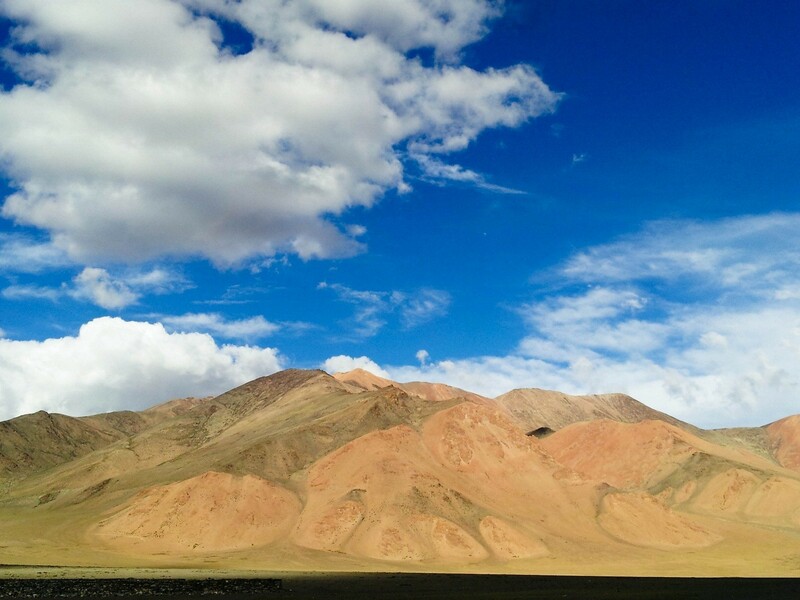 You can check out my Facebook profile for more pictures of ‘How I Got Leh’ed”…… Do comment, criticize, like and share. Taking a bow to RAJA HUSSAIN….. Thank you very much 🙂 No wonder we call it as ‘Incredible India’ ! Raja, after a many years u have made me read something… a mere half an hour is ur blog.. Kudoos bro.. Its an brilliant narration.. Definitely I have my dream visiting leh.. But if tat doesn’t cme true visiting leh, I would rather keep on reading ur blog nd full fill ma dream..
Jahapanna Tussi Great Ho.! !..Tofa Kabul Karo.. Kudos!!! thank u for sharing such a wonderful experience..i hope this could be an inspiration for most of the guys like me…. May i know the name of the organization you had your package with?